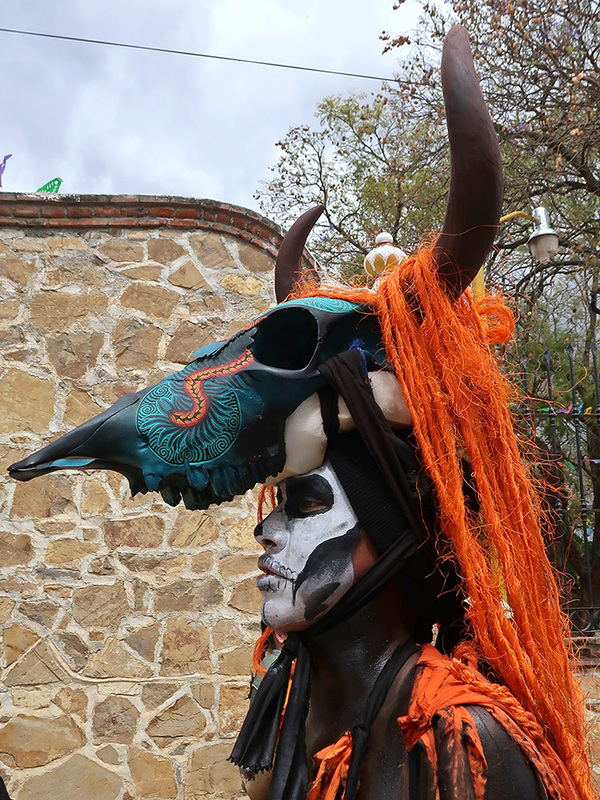 …we know who are the behind-the-scenes heroes of fiestas like this. 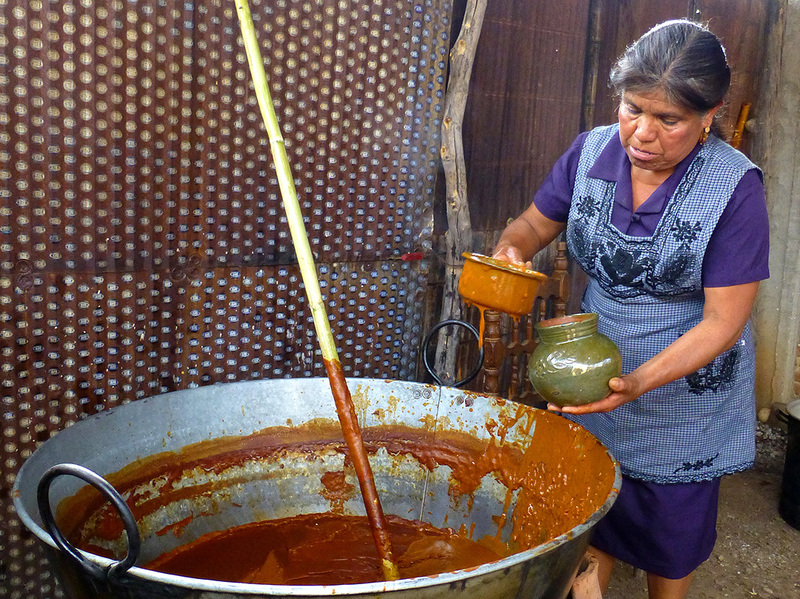 It is the abuelas with their hands, hearts, and mouthwatering recipes (like the mole amarillo, above) handed down from their grandmothers. 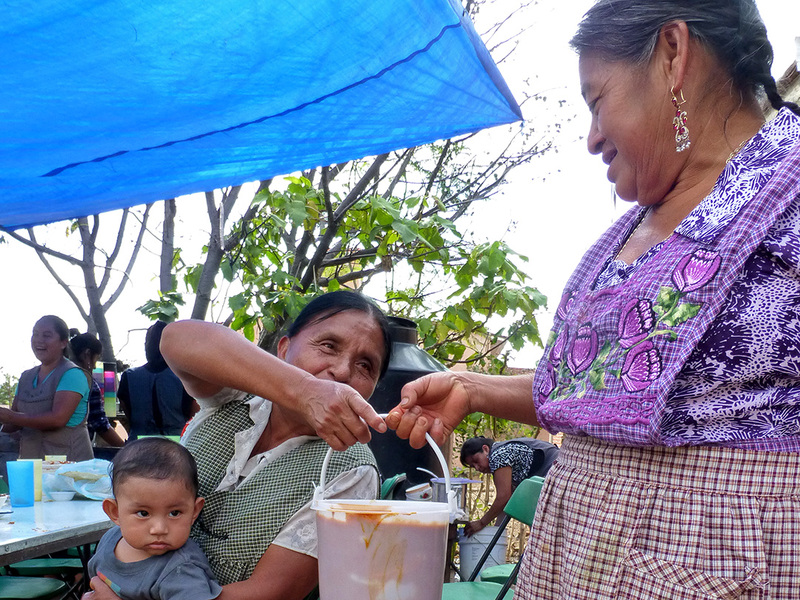 Even while bouncing nietos (grandchildren) on their knees, with good humor, grace, and their elaborately embroidered aprons, they make certain everyone is fed. 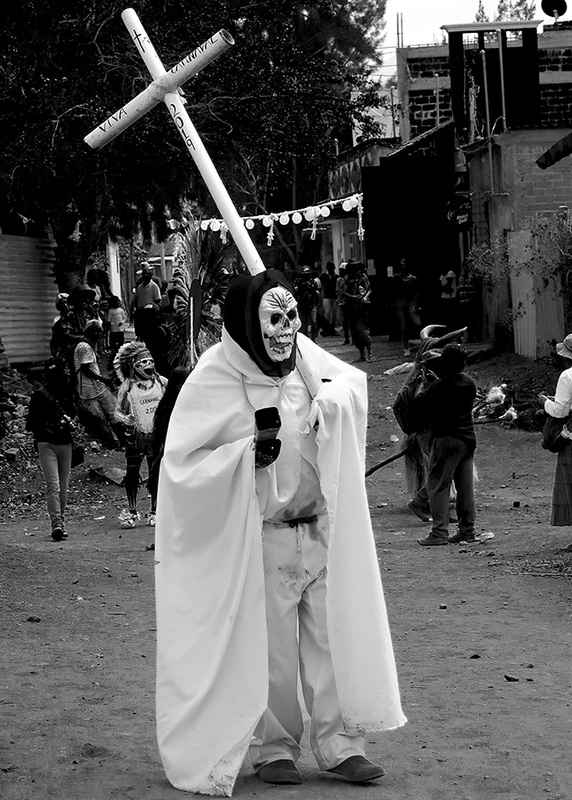 And, they keep a strict accounting of all that is spent! 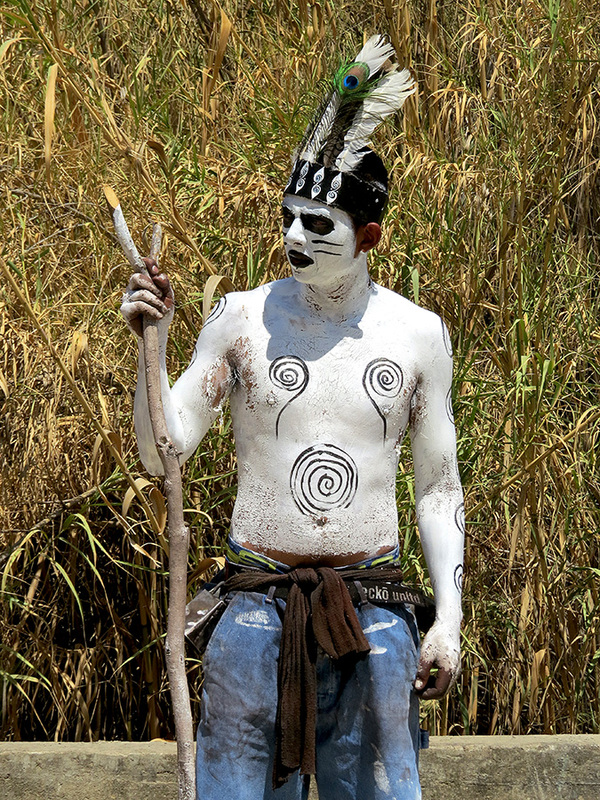 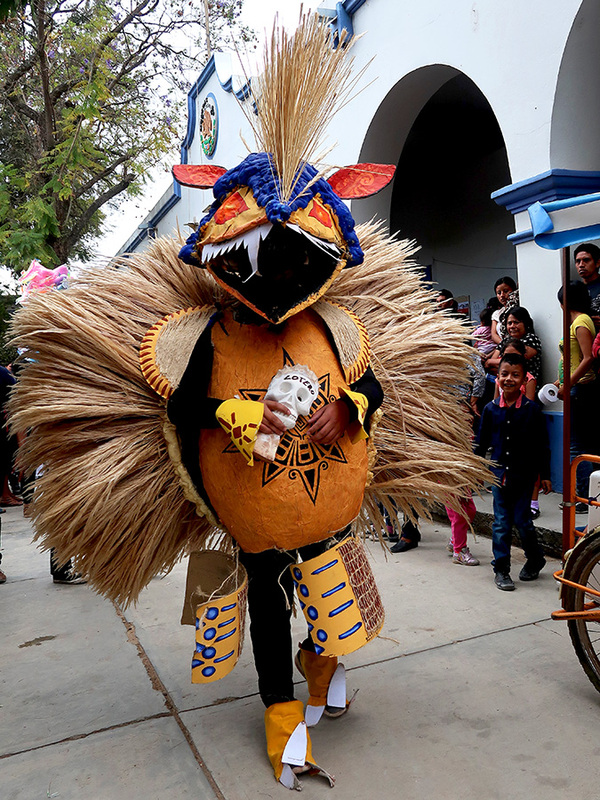 It’s Carnaval time in Teotitlán del Valle. 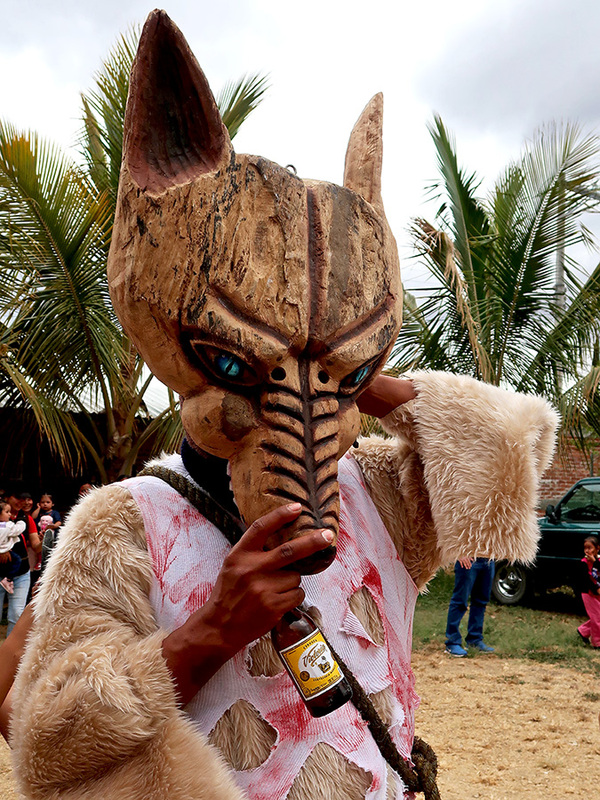 Yes, I know, Easter was last Sunday and Lent is over. 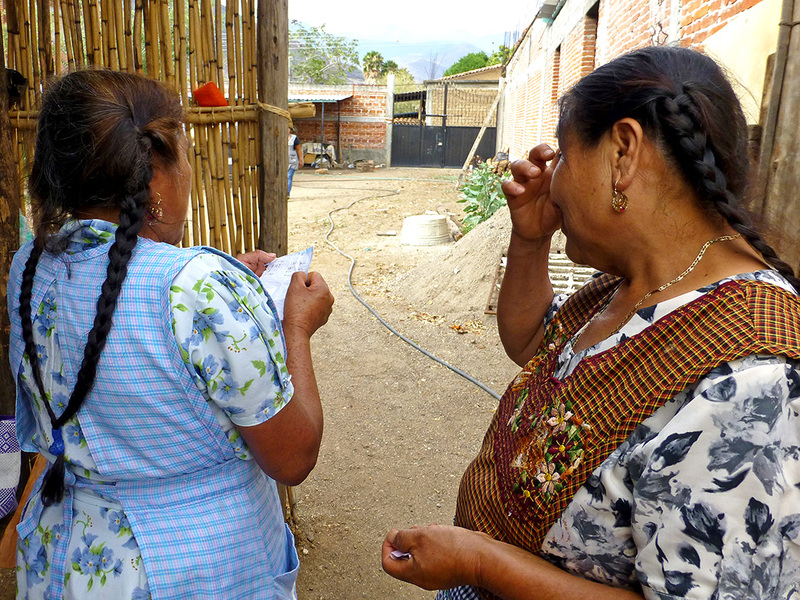 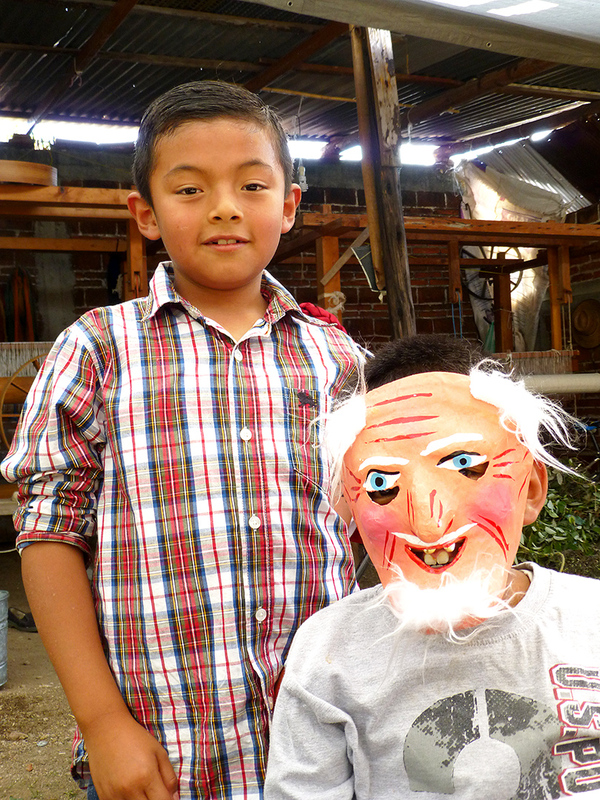 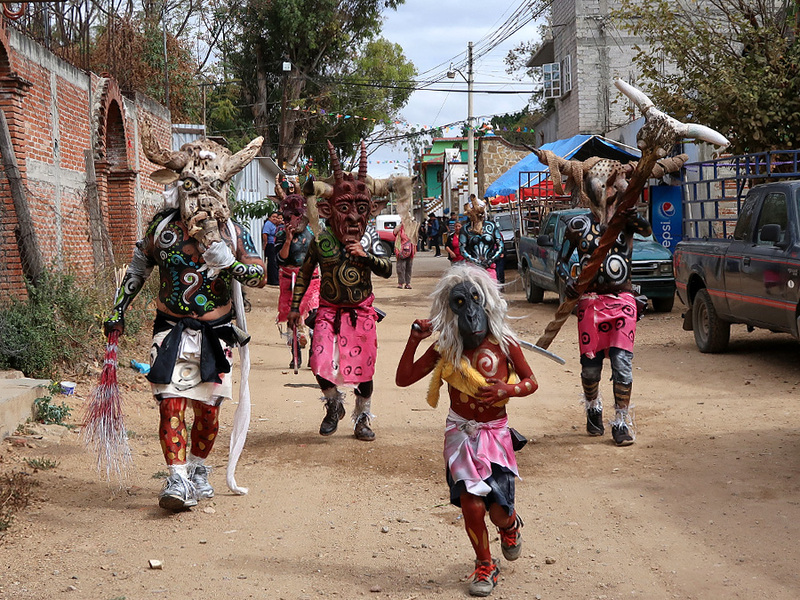 However, like many other things (e.g., not going on Daylight Saving Time), this Zapotec village does things their own way. 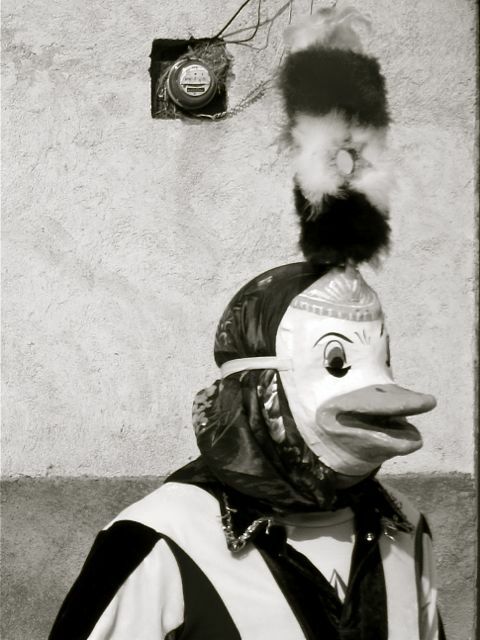 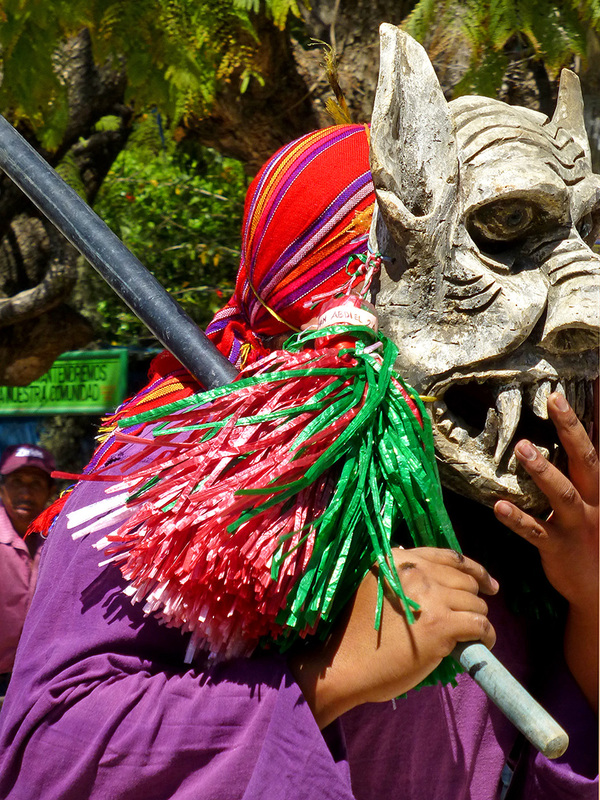 Thus, instead of celebrating Carnaval the day before Lent begins, they celebrate for the five days following Easter! 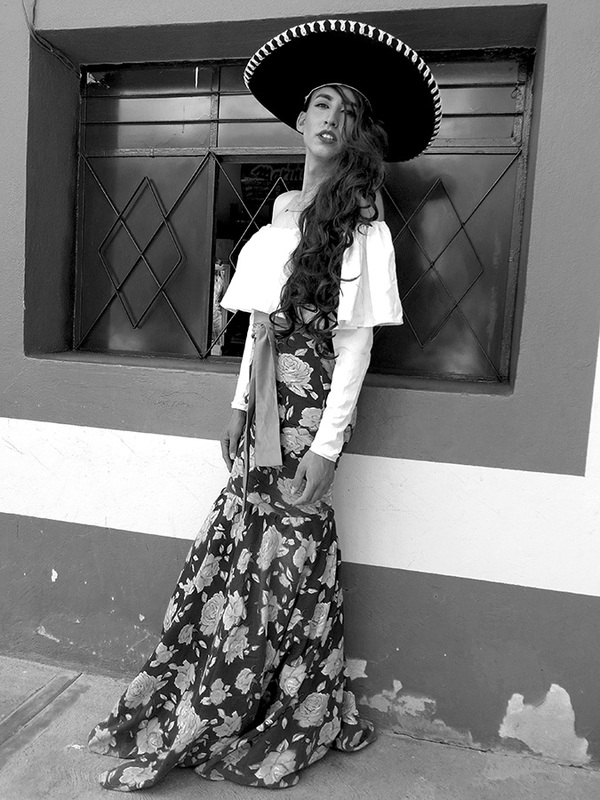 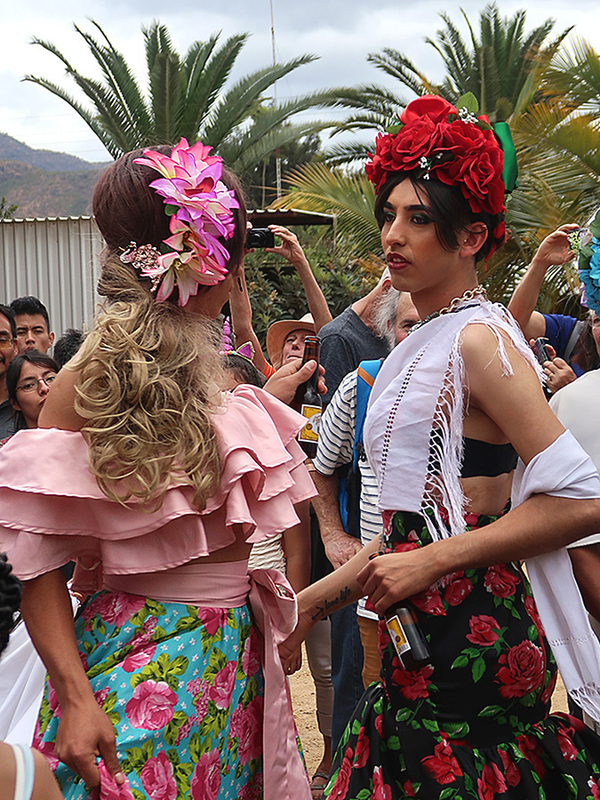 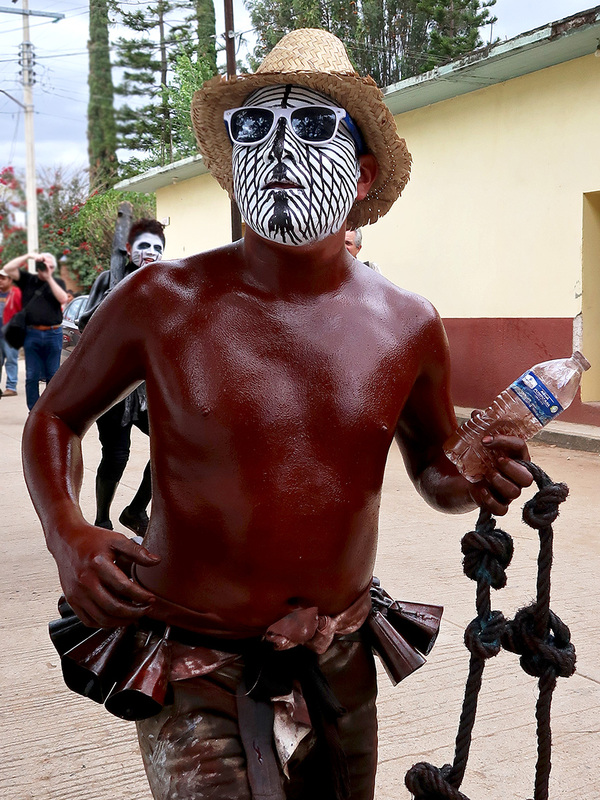 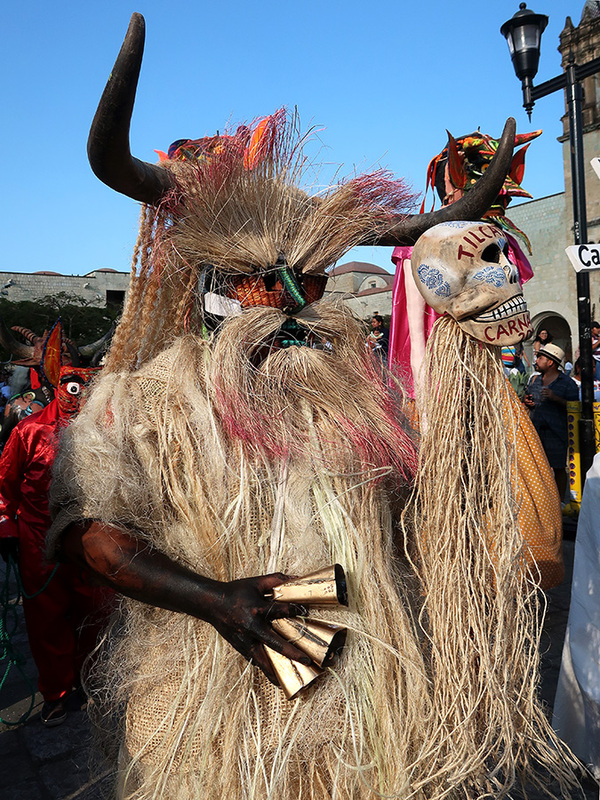 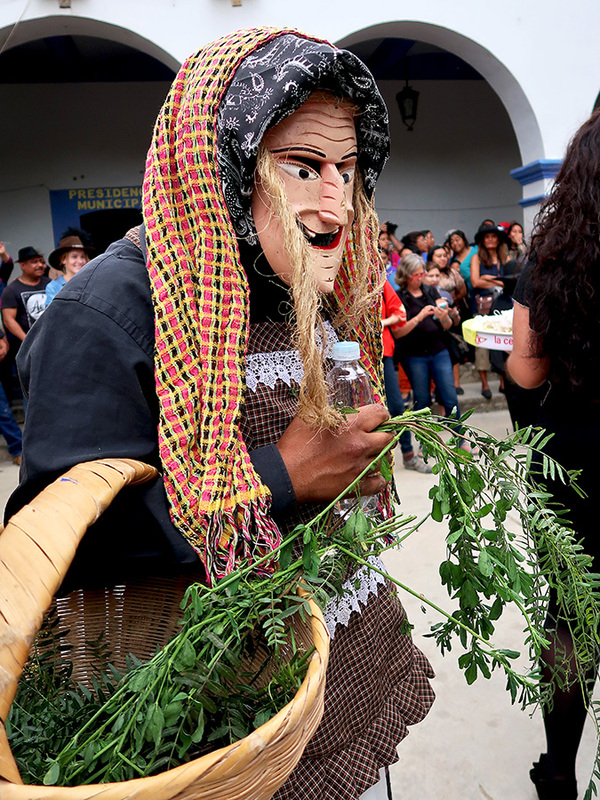 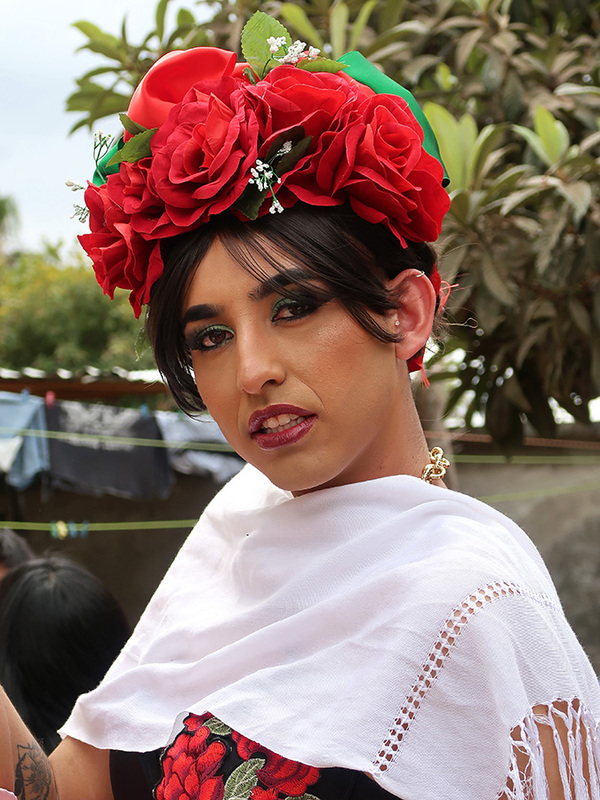 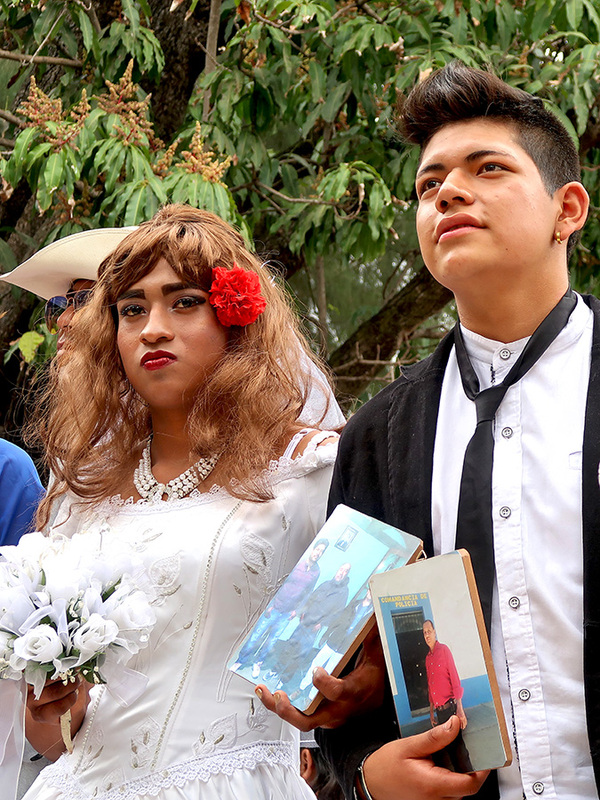 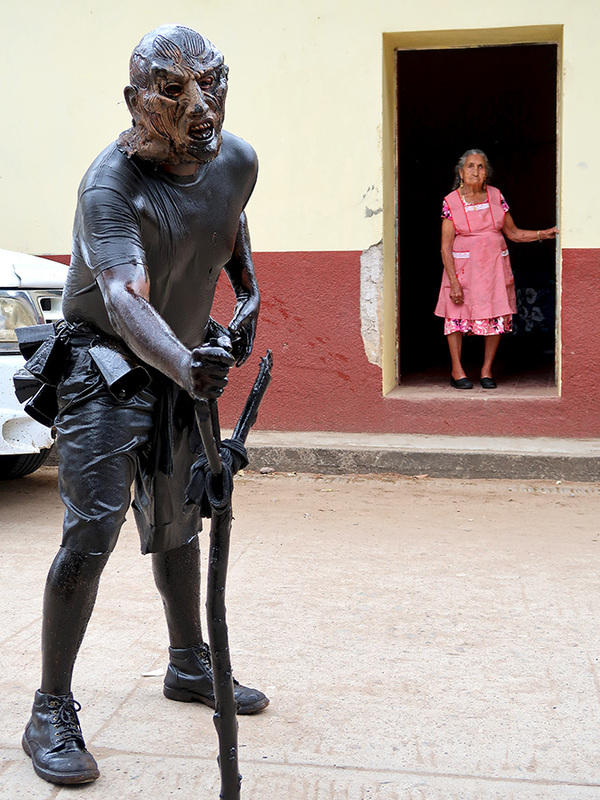 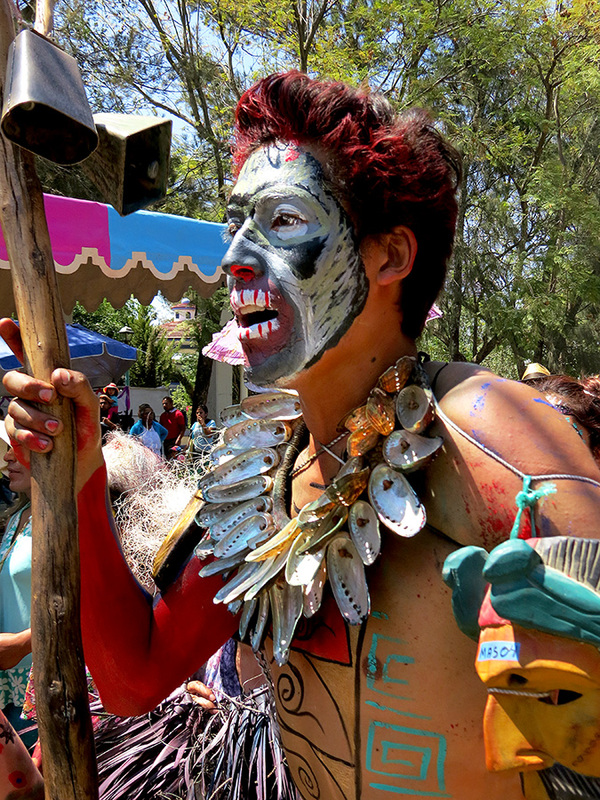 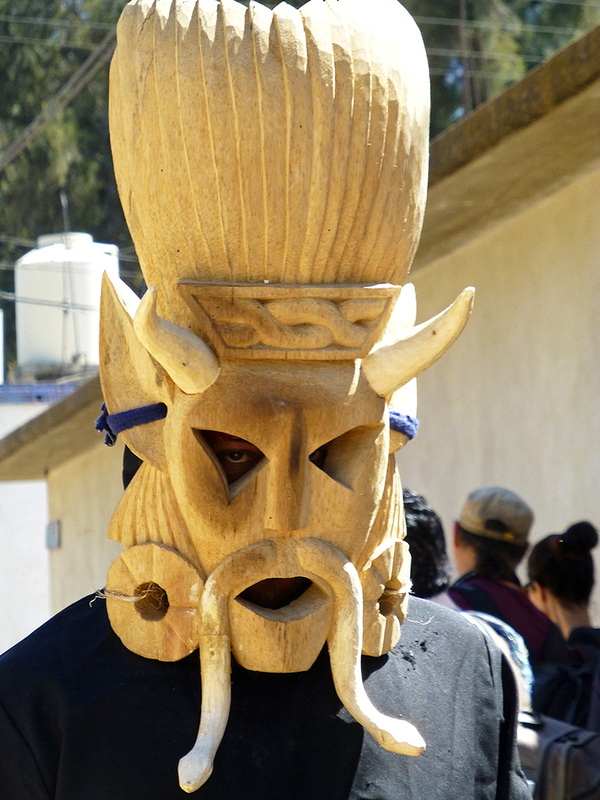 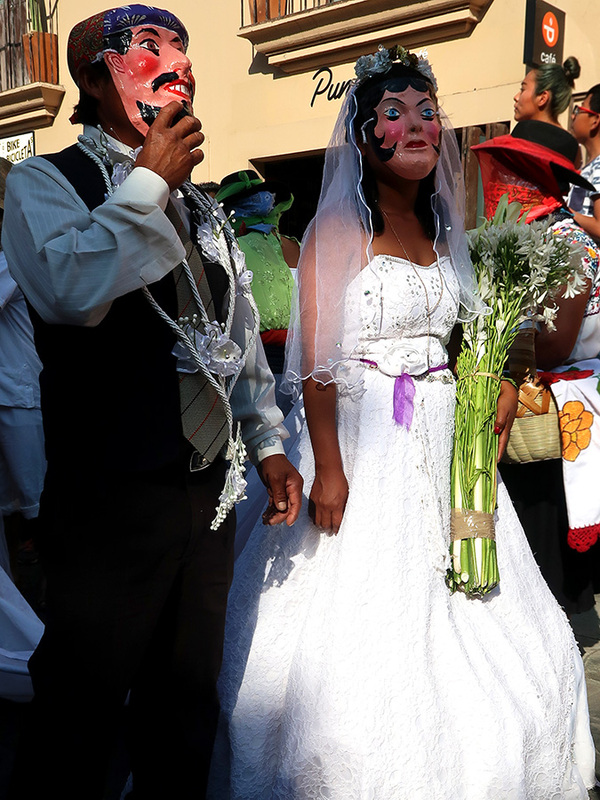 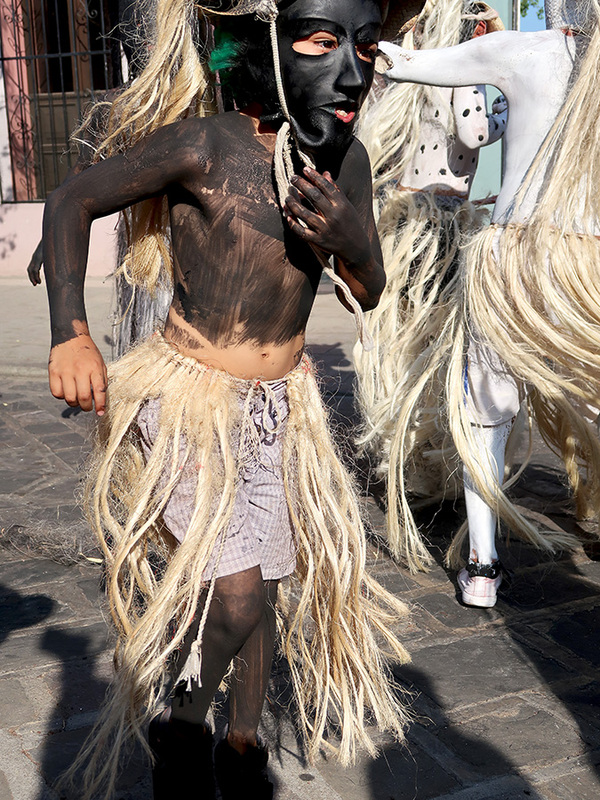 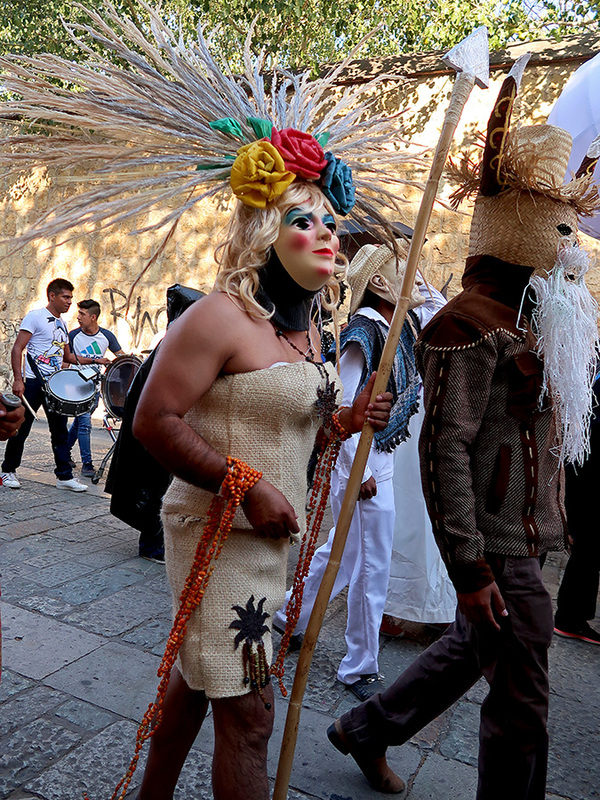 As I’ve written about previously, Carnaval in Teotitlán is a major production that indeed takes a village; young and old, female and male all have parts to play in the festivities that include music, masked men, mezcal, and mouthwatering mole. 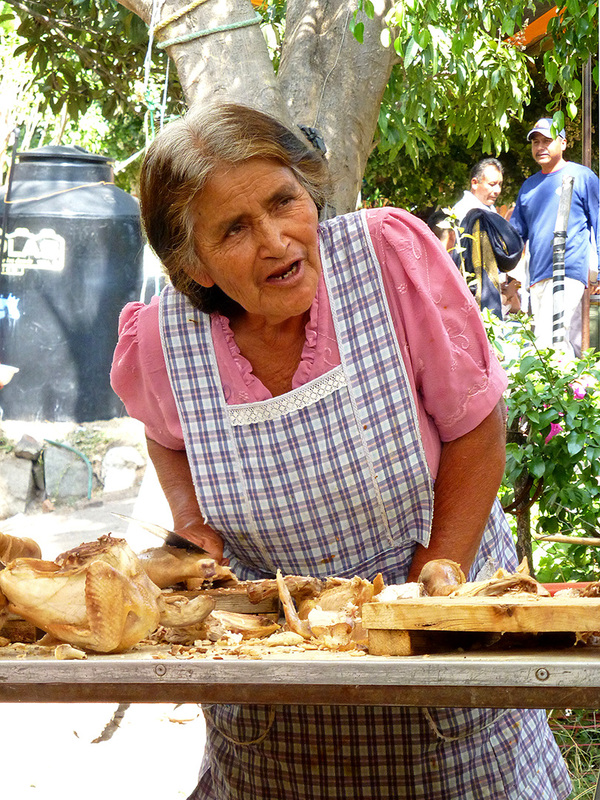 Yesterday, rather than sitting with the men and scattering of male and female extranjeros, gal pal J and I hung out with the women and children in the outdoor kitchen that had been set up in the back of the large earthen courtyard. 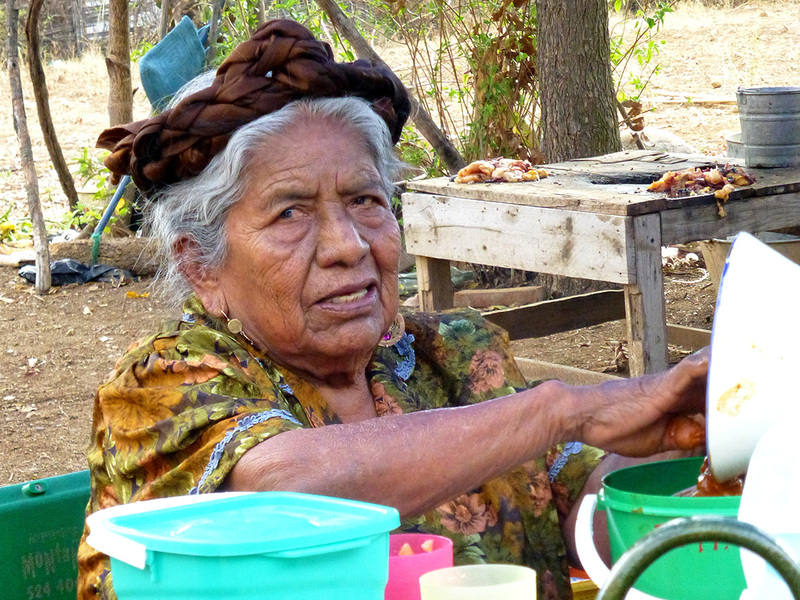 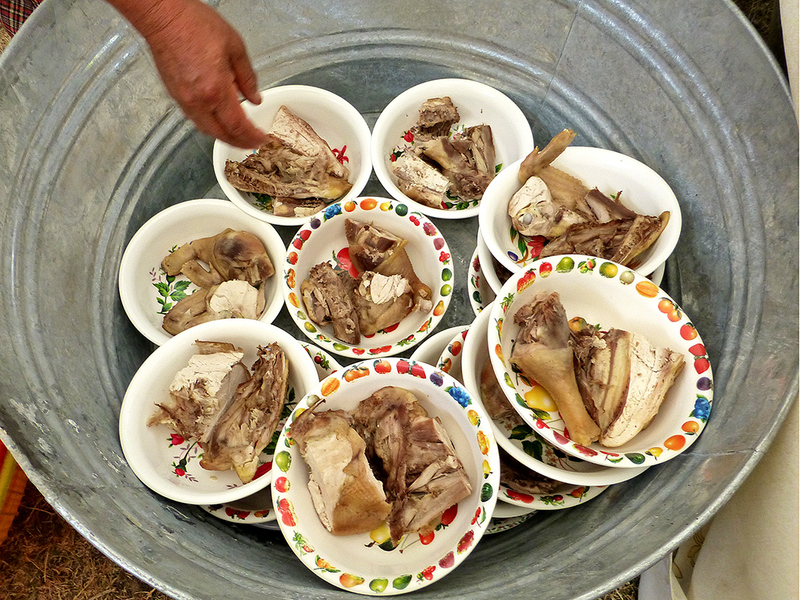 There the women prepared enough chicken, mole amarillo, and tortillas to feed one hundred! 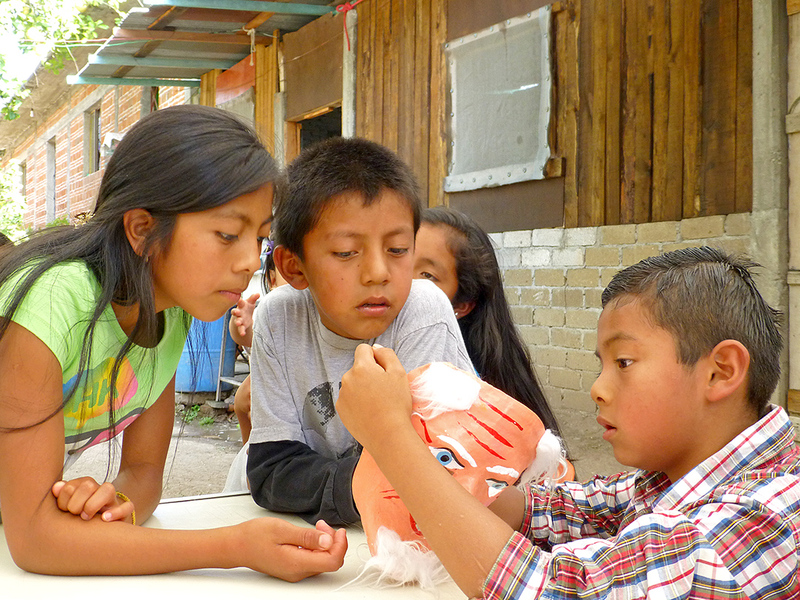 The seemingly always well-behaved kids played and took care of the babies while their mamas and abuelas worked. 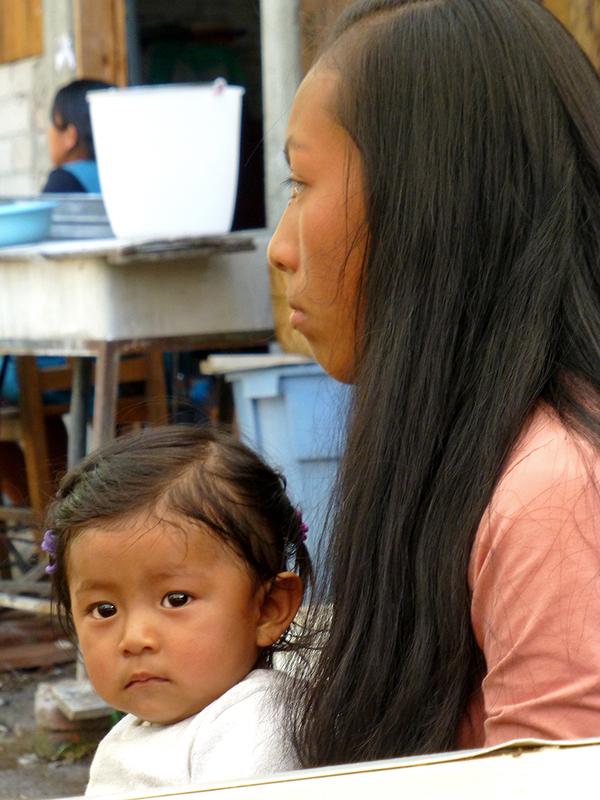 Muchisimas gracias to the women and children of Teotitlán del Valle’s Segunda Sección for being so gracious and welcoming. 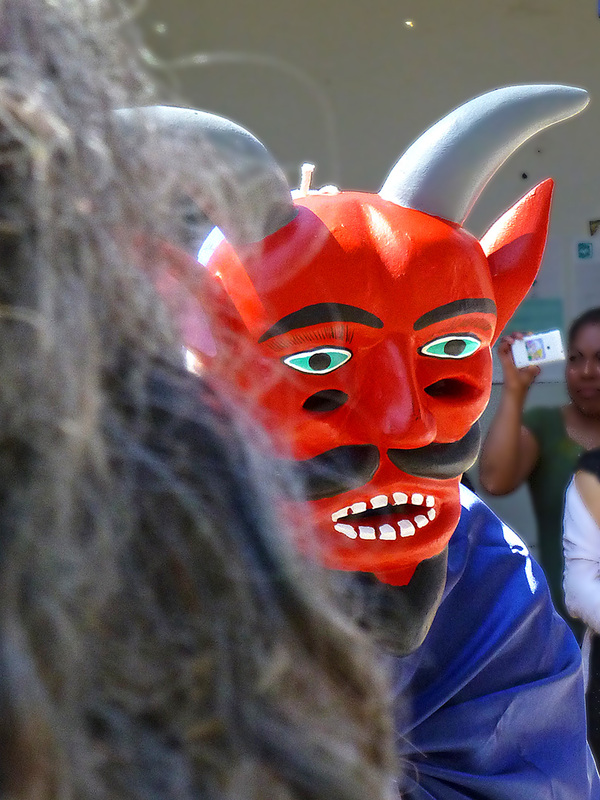 Tête-à-tête between Viejitos (I know, I’m mixing languages), seen between the shoulders of two municipal leaders, on the Municipal Plaza in Teotitlán del Valle during this year’s previously mentioned Carnaval. 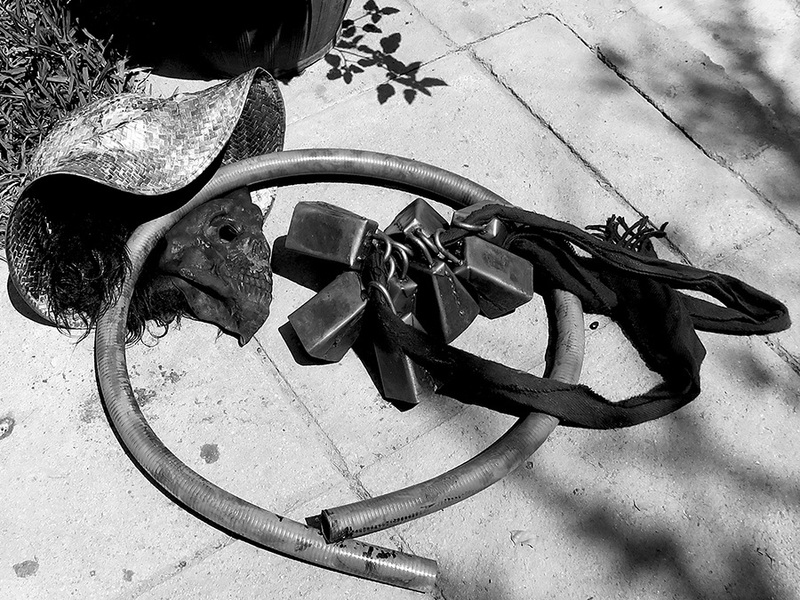 However, this break-in-the-action gives me time to look back through thousands of photos and create posts that had been put on the back-burner when something bigger, better, or more timely cropped up. 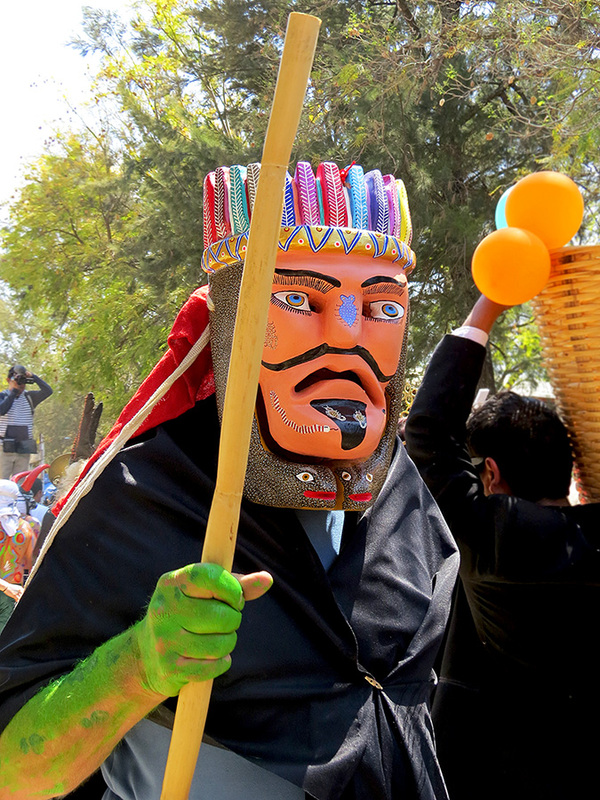 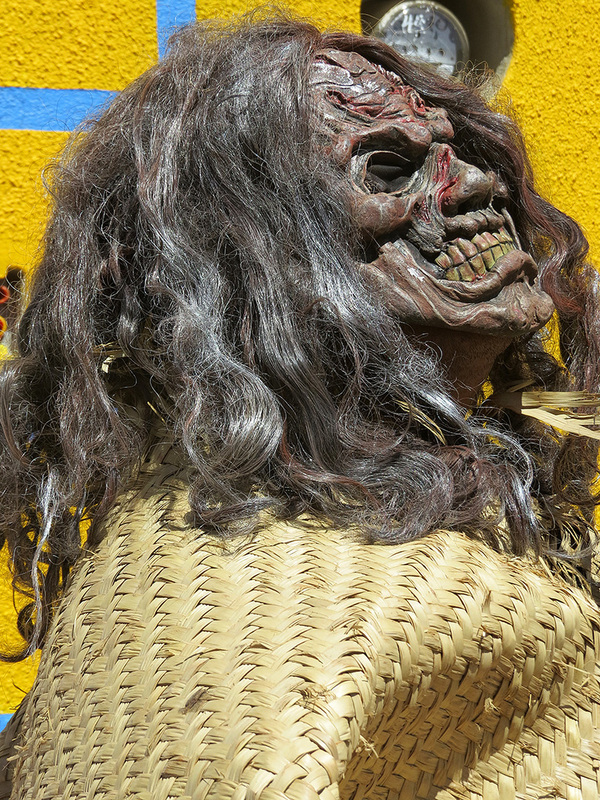 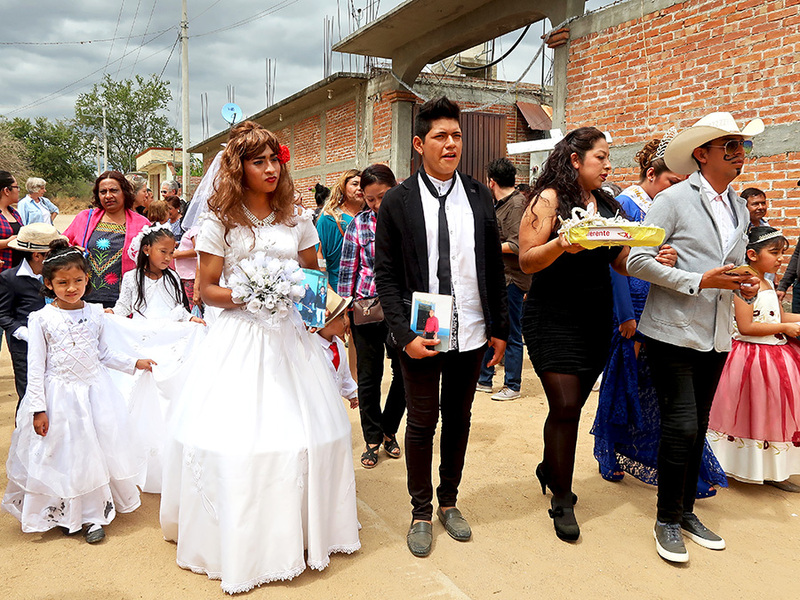 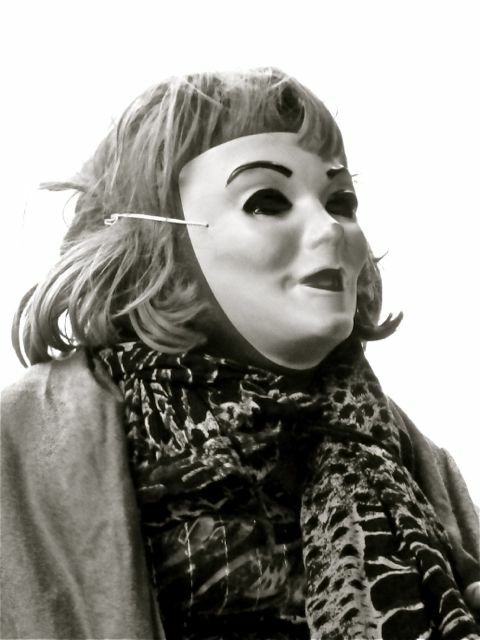 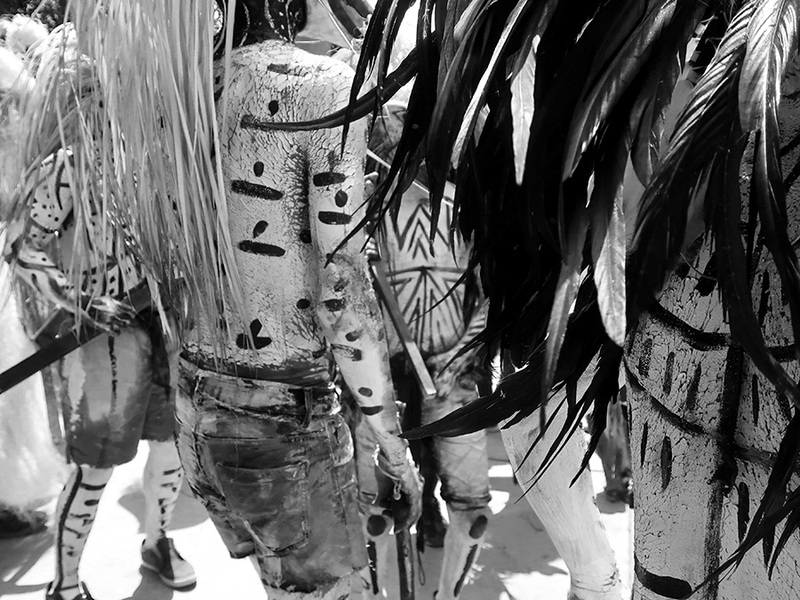 So, here we go, back to Friday, April 24, 2014 — the last of five days of Carnaval in Teotitlán del Valle. 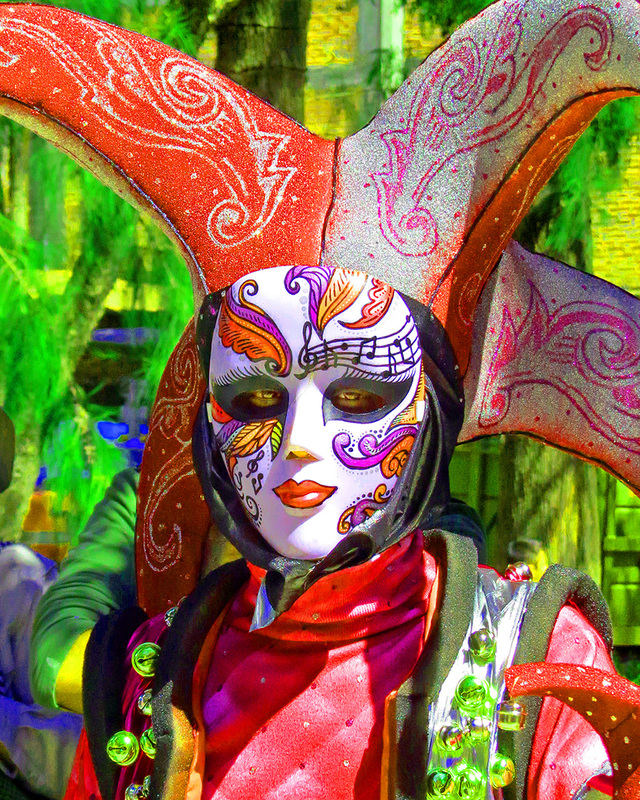 While there are masks, costumes, men dressed as women, and merriment, this is not your Christian pre-Lenten Fat Tuesday/Mardi Gras Carnival. 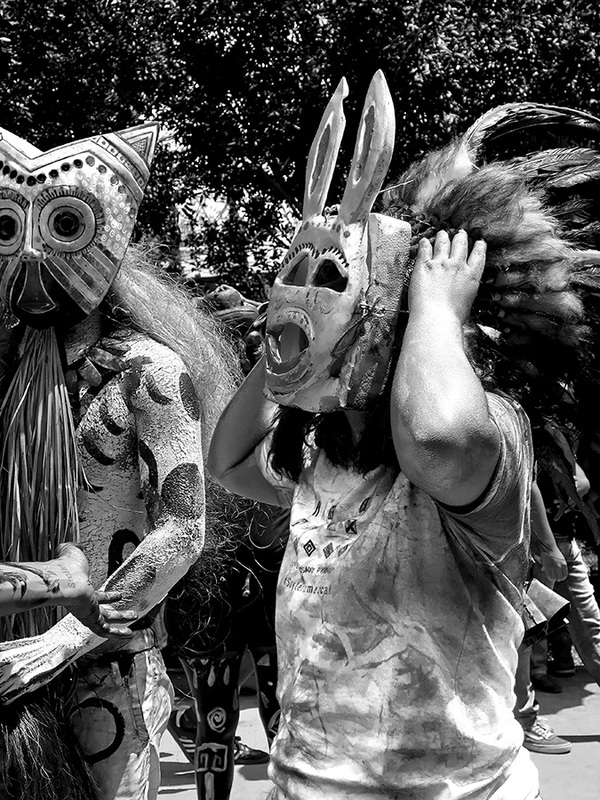 This is a pre-Hispanic celebration that happens the Monday through Friday after Easter, not before Lent. 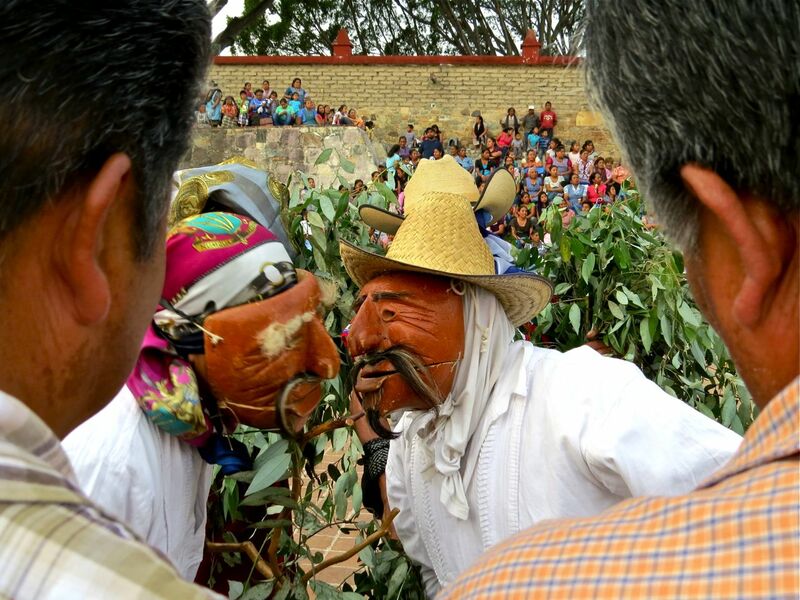 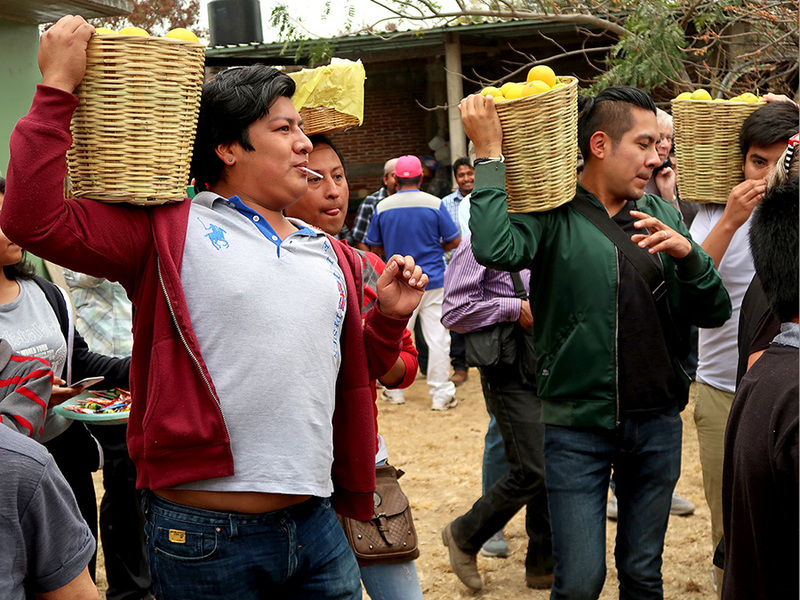 Via El Baile de Los Viejitos (the Dance of the Old Men), it brings the community and elected leadership together to remind each of their social contract — in an extremely humorous way. 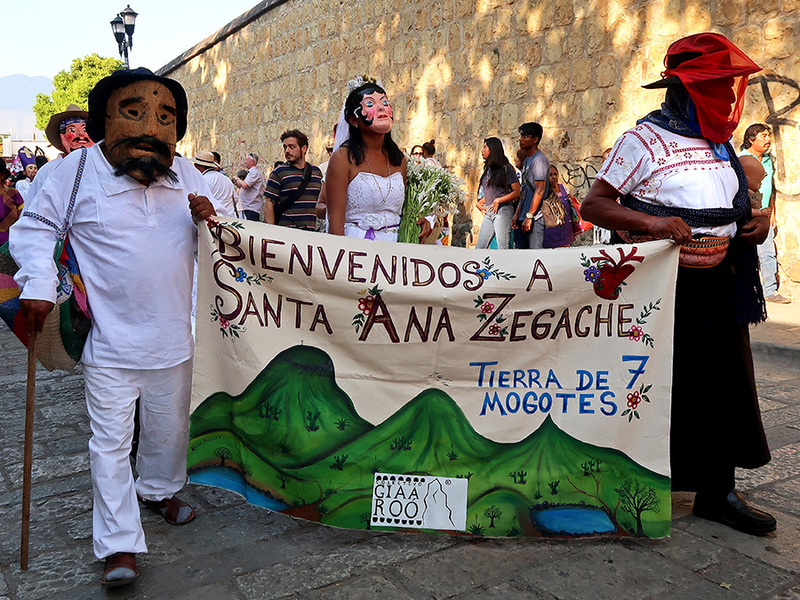 A procession, gathering participants along the way, leads to the Municipal Plaza, where it seems as if the entire village assembles. 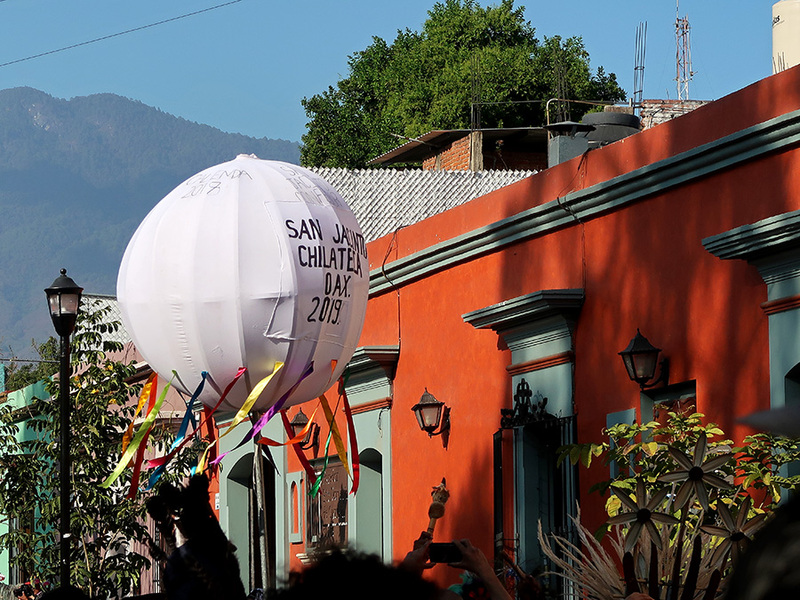 Another day… another celebration… another adventure! 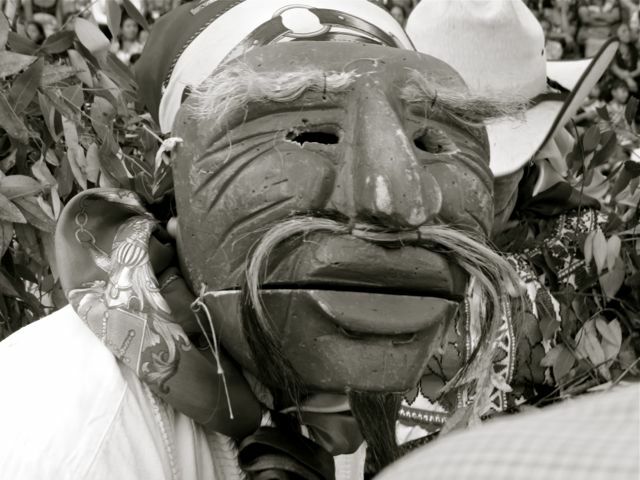 Yesterday was Día de Carnaval (aka, Fat Tuesday, Mardi Gras, Carnival), a day to let the good times roll before the sacrifices of the Lenten season. 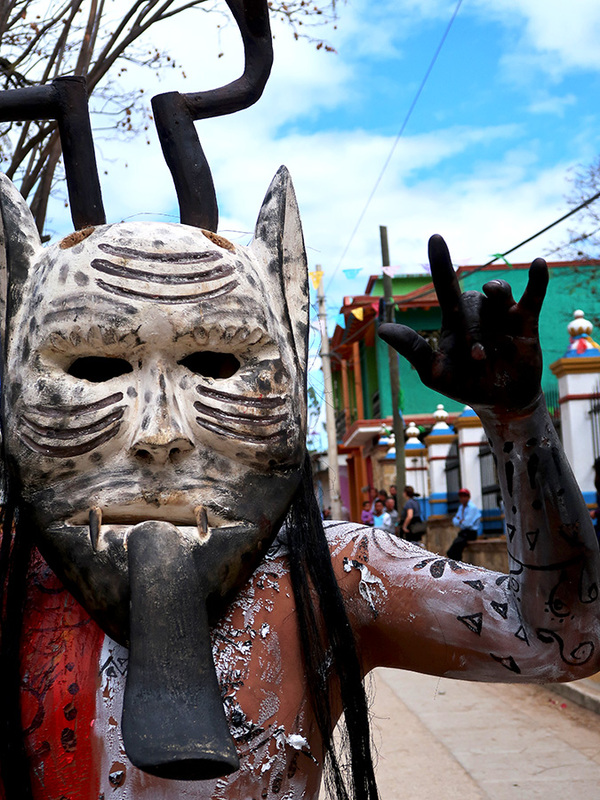 And so, off we went for Día de Carnaval in San Martín Tilcajete (28 km south of the city), a village known for its fancifully painted wood-carved alebrije and masks. 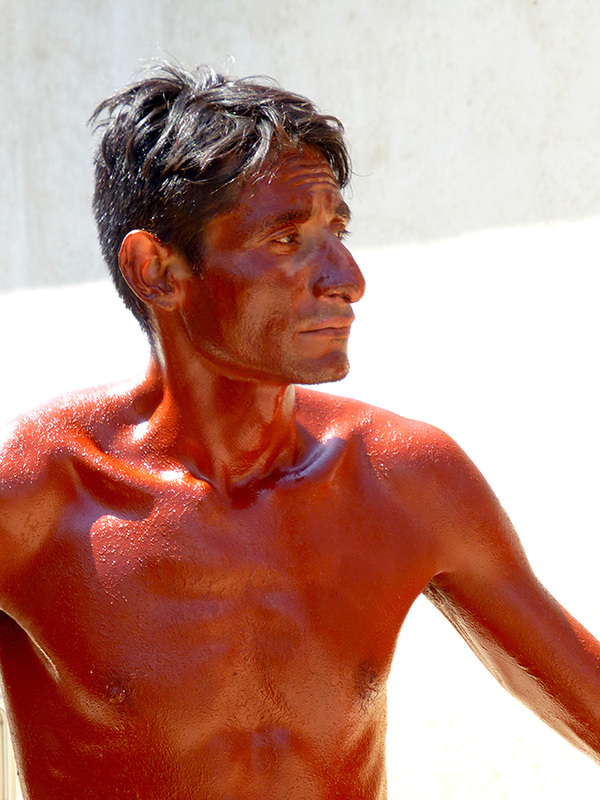 We are still doing May weather in March and, thus, it was hot and shade was in short supply. 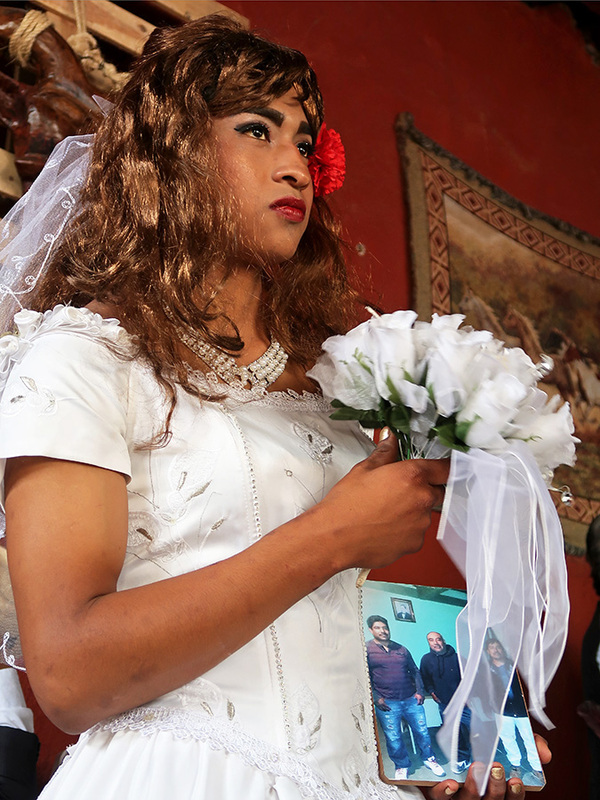 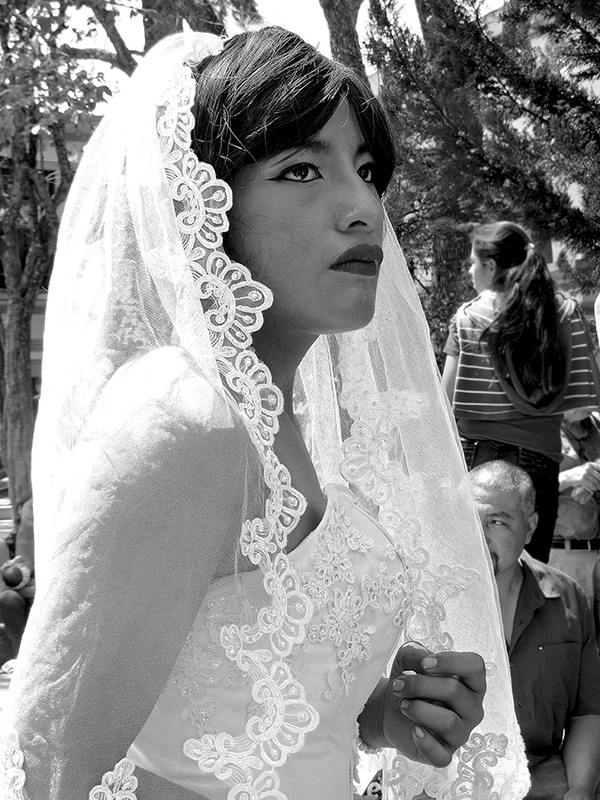 In the morning, a bride and groom were chosen, villagers gathered for a boisterous and hilarious ceremony in the courtyard, they danced, and then all processed through the streets of San Martín Tilcajete to a designated location where the happy “couple” knelt before a jolly looking “priest.” By the way, those beautiful “women” in gorgeous gowns aren’t what they seem! 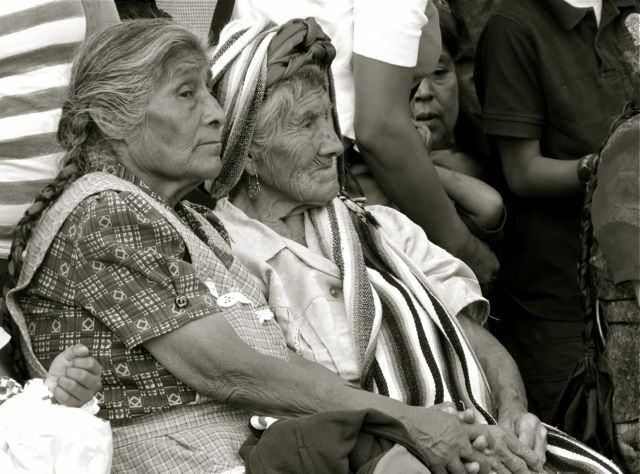 Young and old, the “guests” were a colorful crowd. 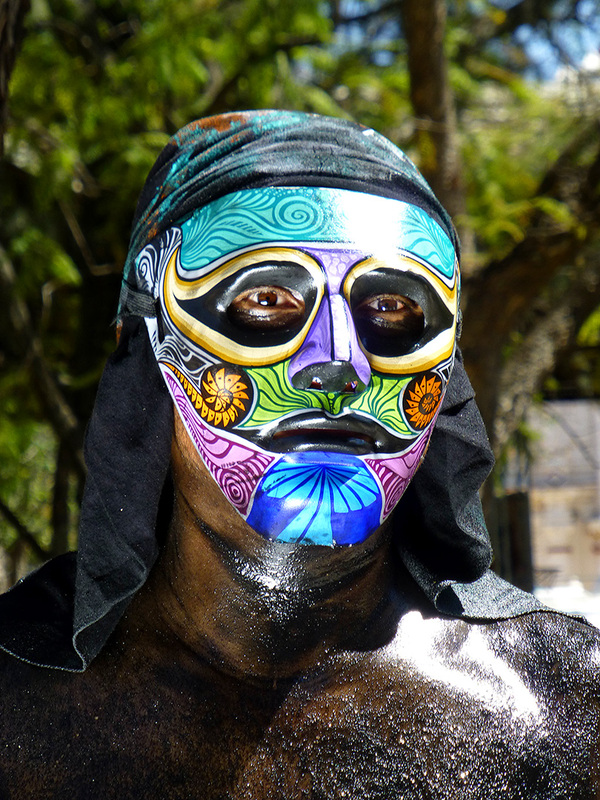 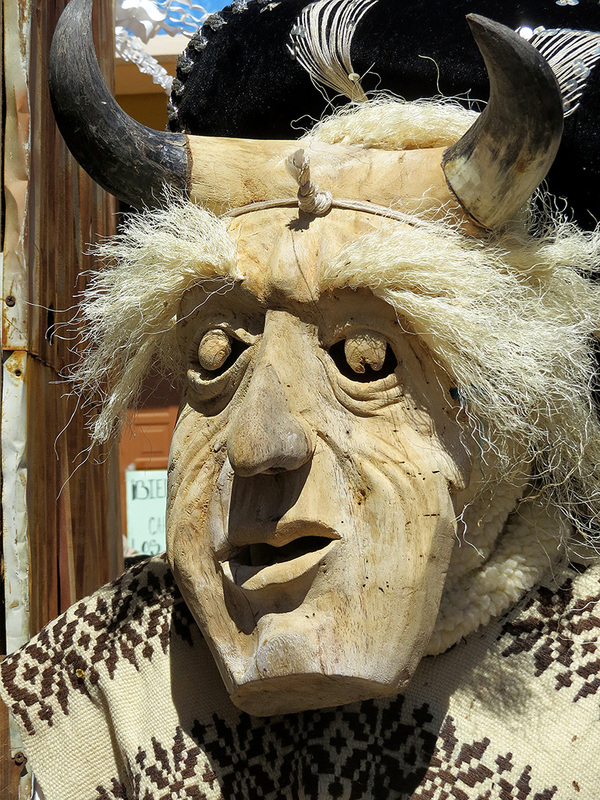 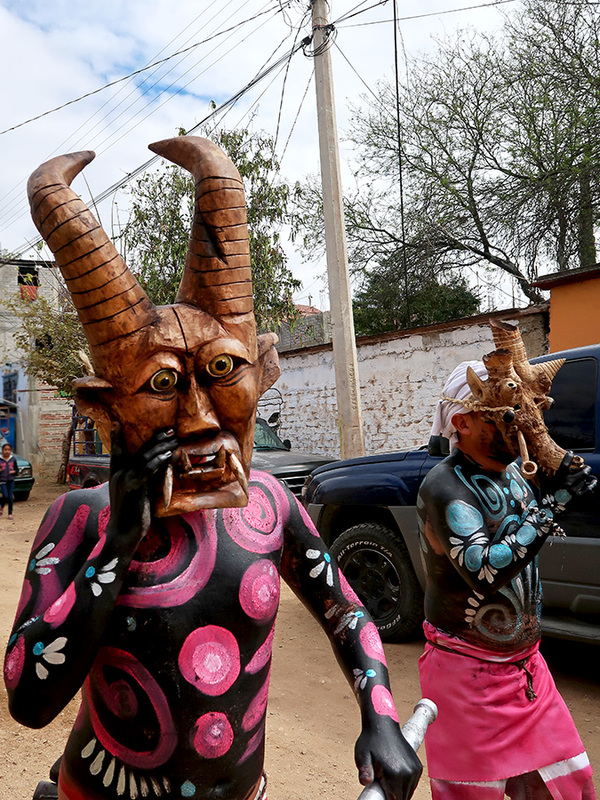 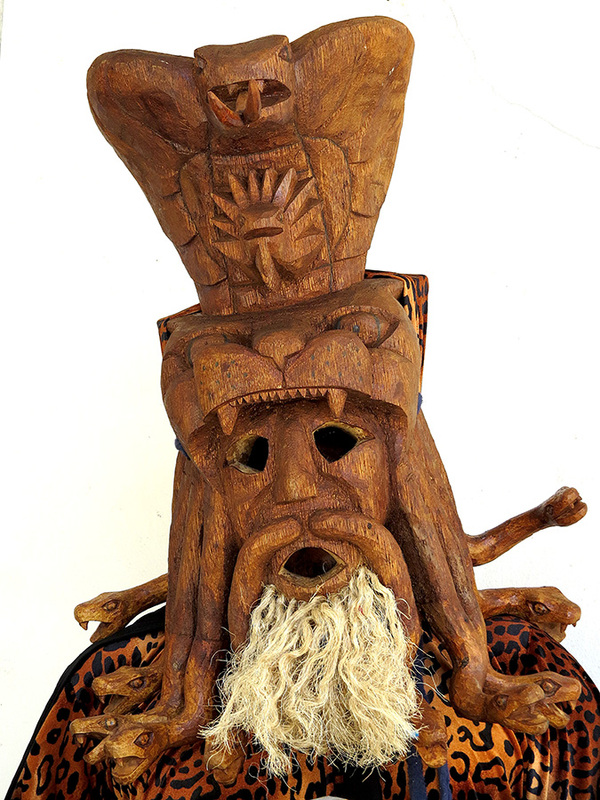 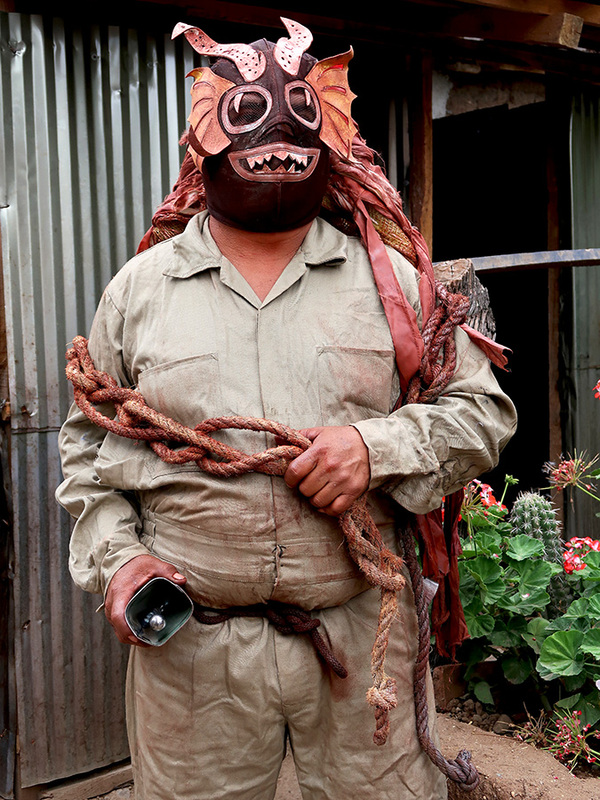 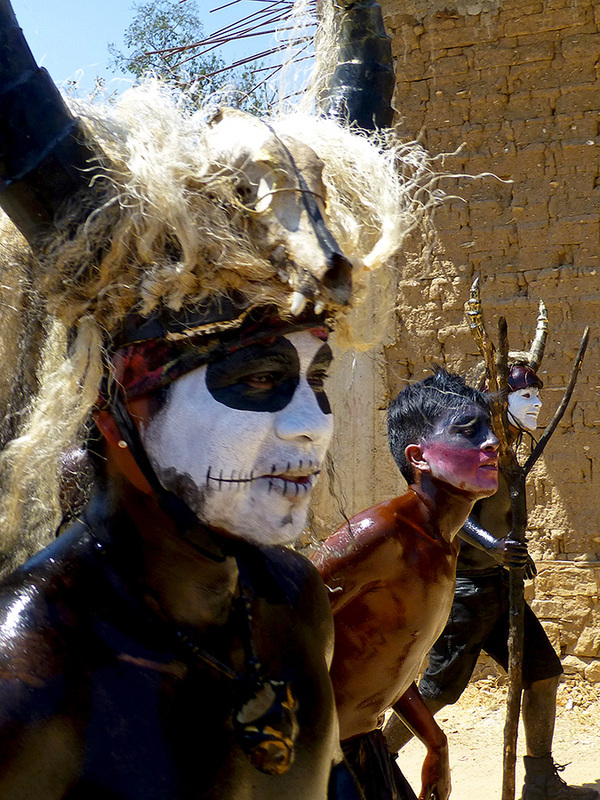 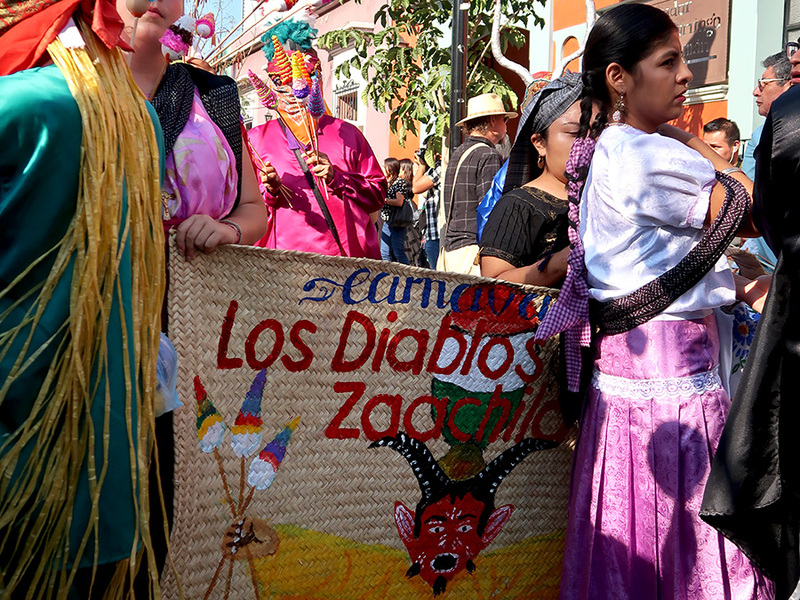 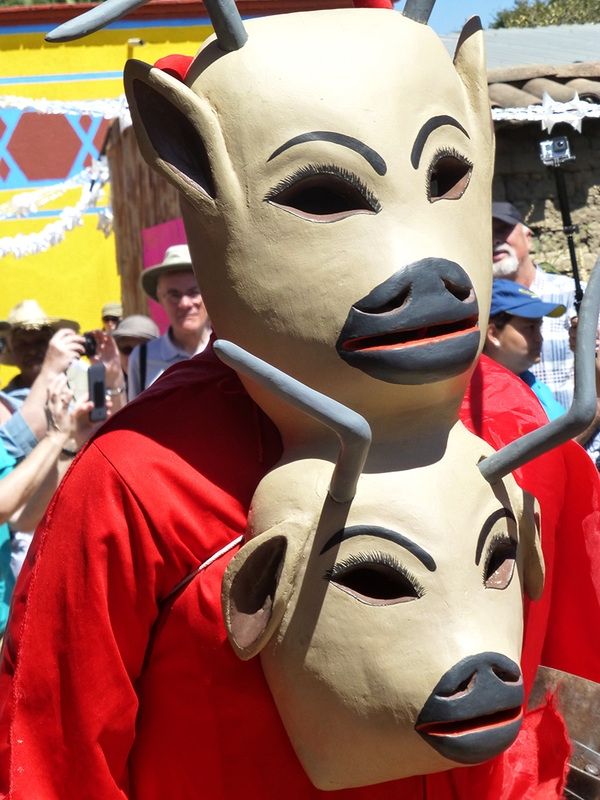 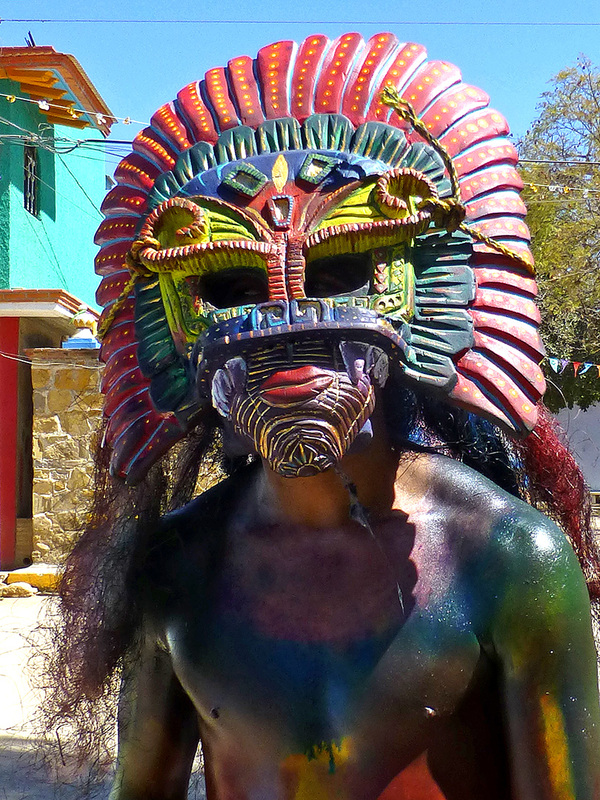 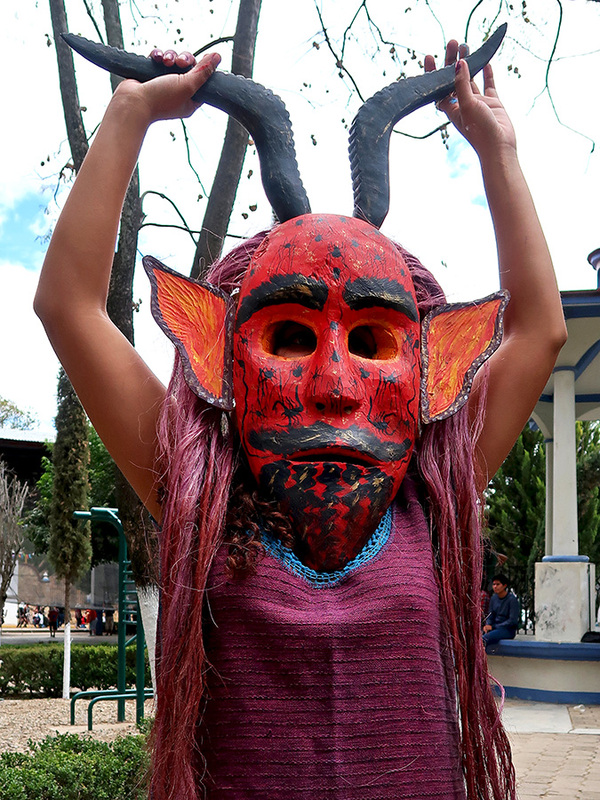 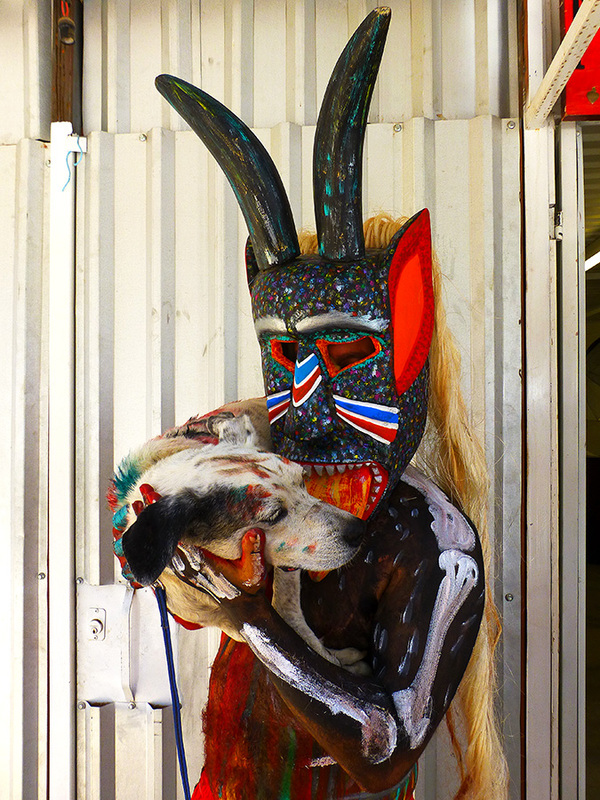 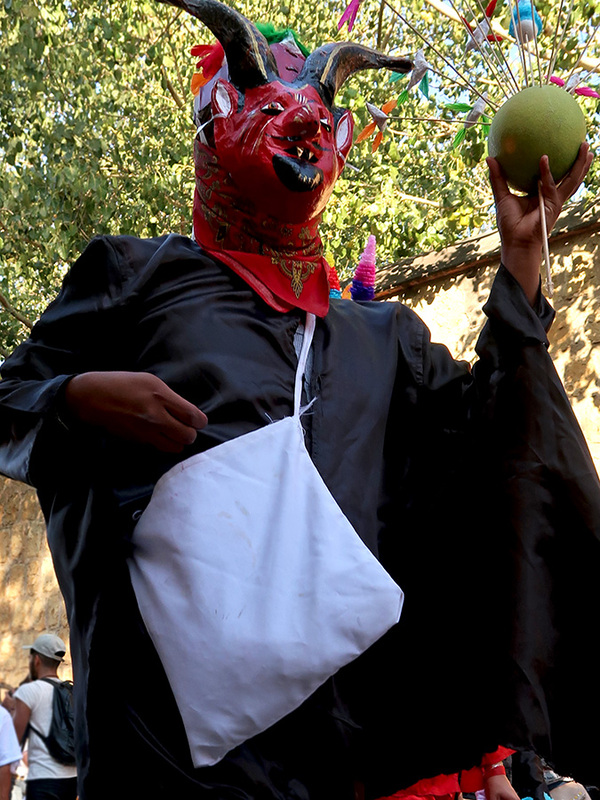 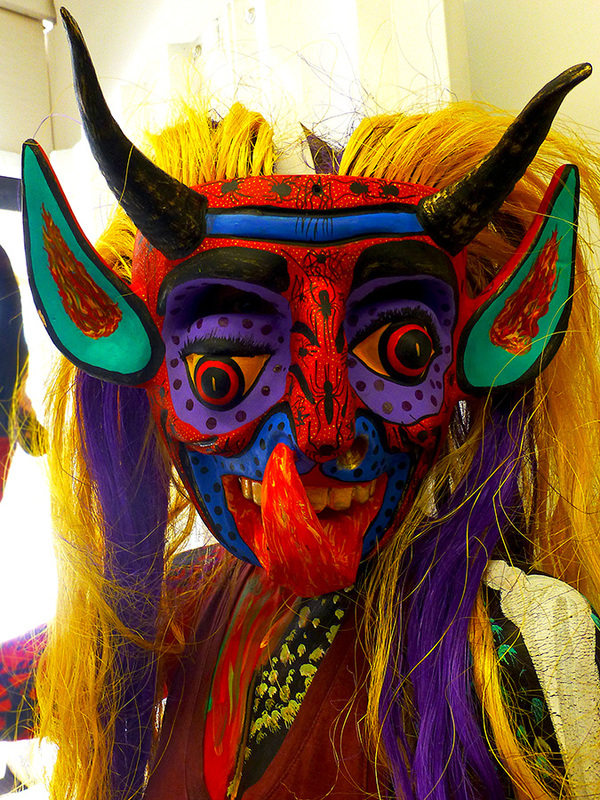 Many of the diablos and diablillos covered their faces with colored pigments and their bodies with red or black oil — rumor has it, motor oil is sometimes used. 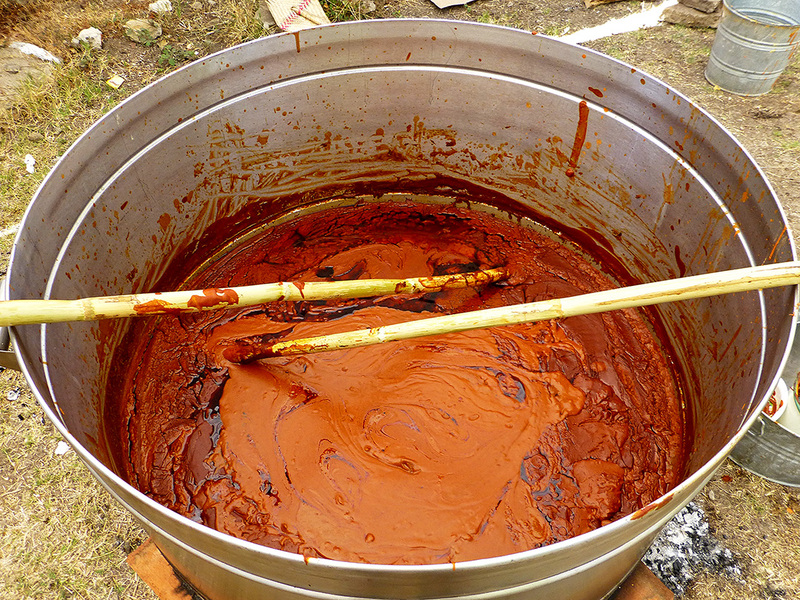 Yuck! 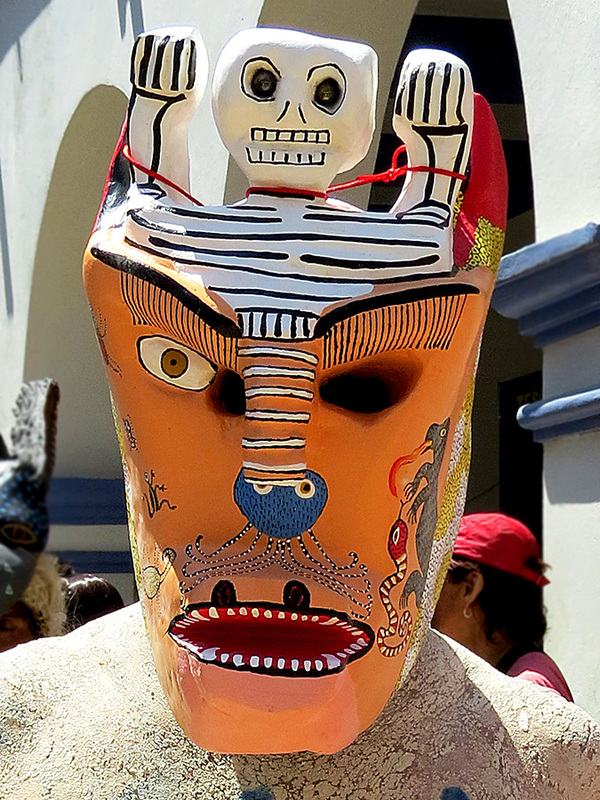 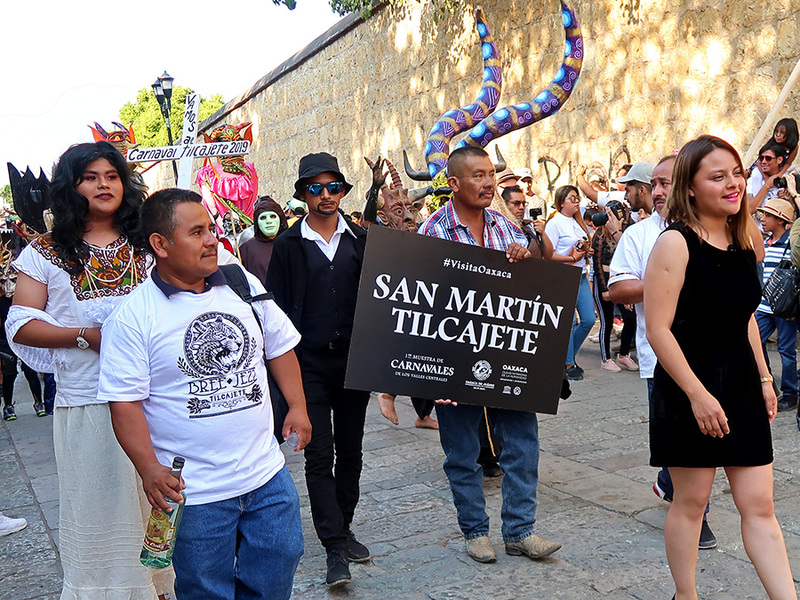 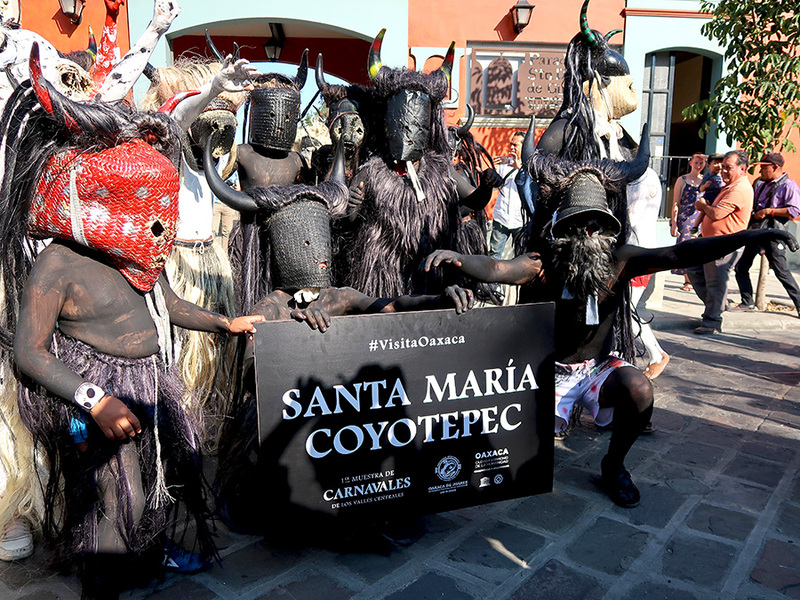 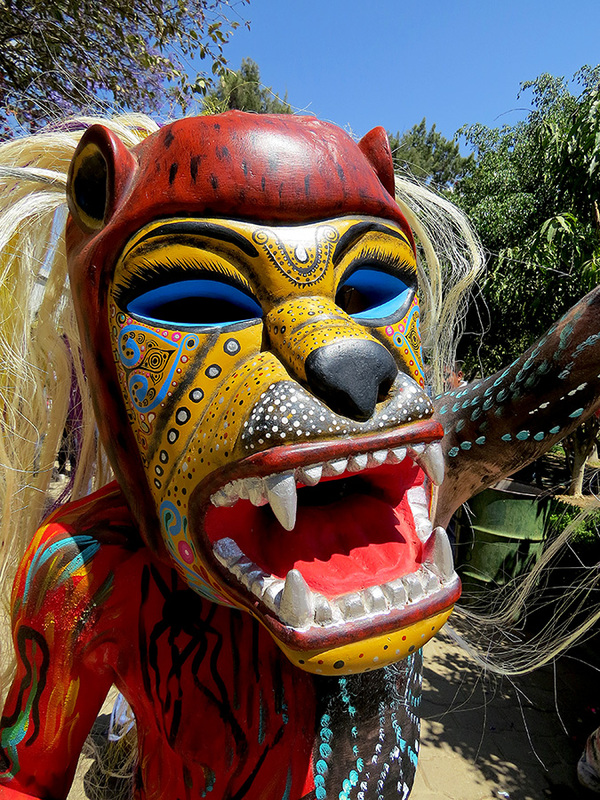 I’d been to San Martín Tilcajete many times — to go from one workshop to another in search of the perfect alebrije for a gift or to add to my collection — but never before for Carnaval. 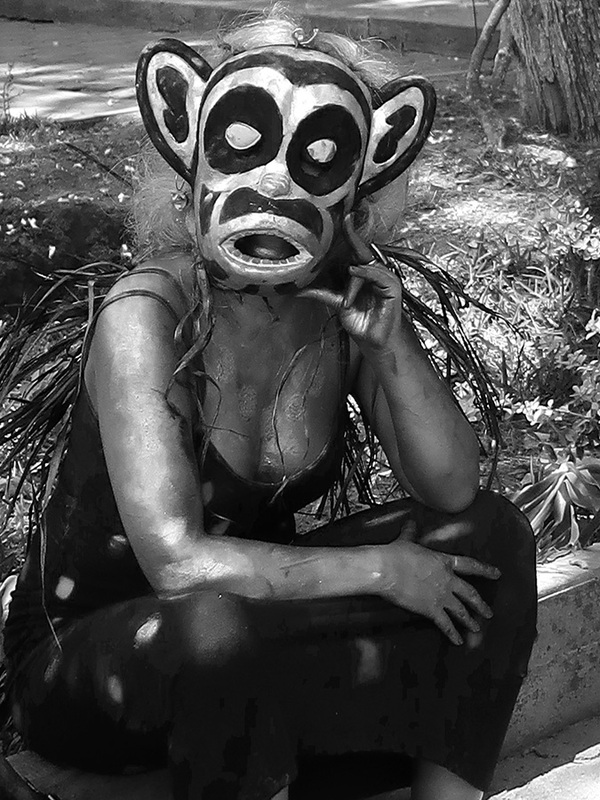 It was great fun and the photo ops were endless. 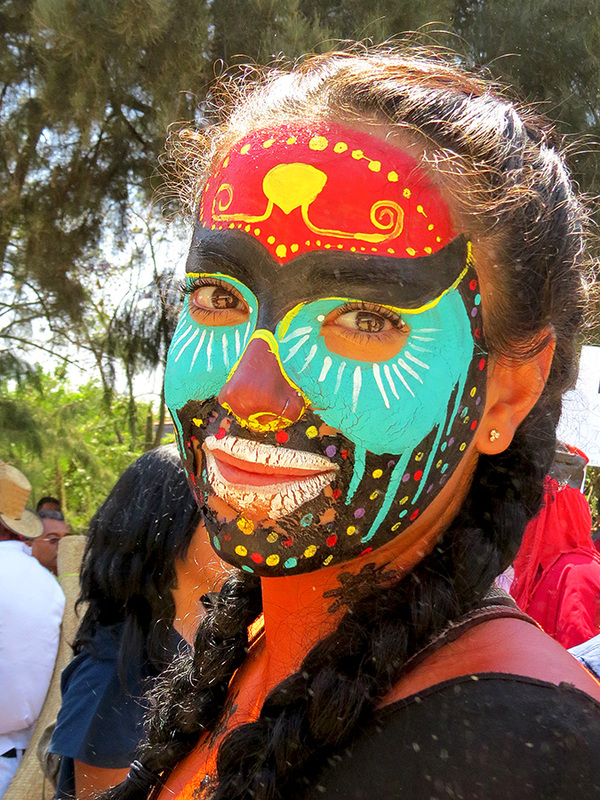 Sometimes color seems like a distraction, so an experiment in de-saturation from the last day of Carnaval in Teotitlán del Valle. 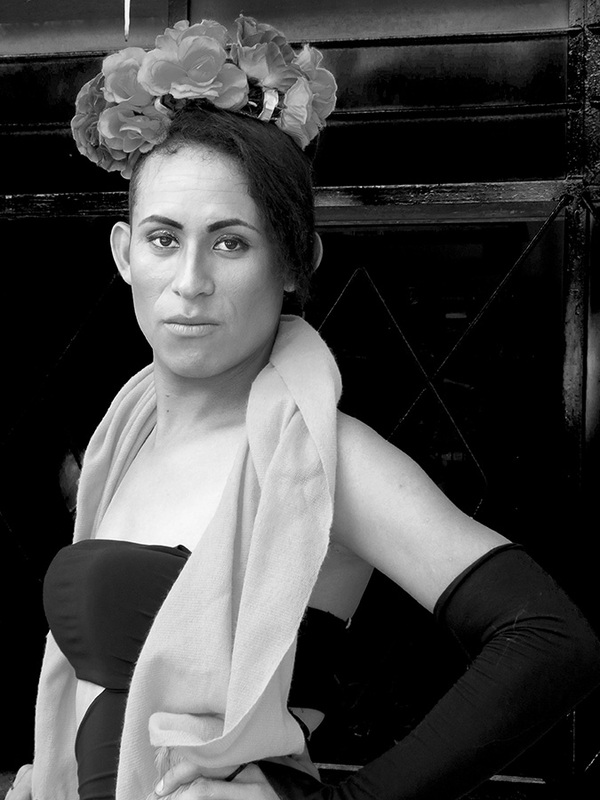 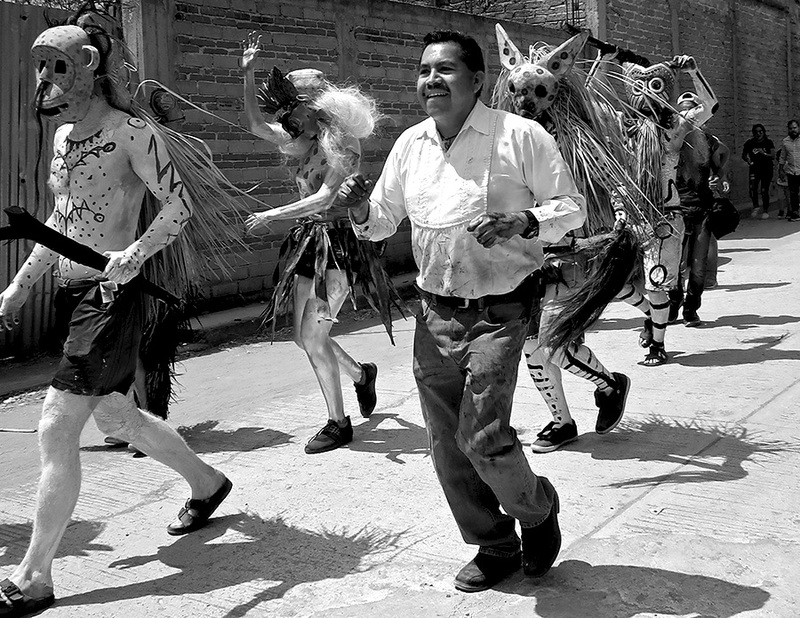 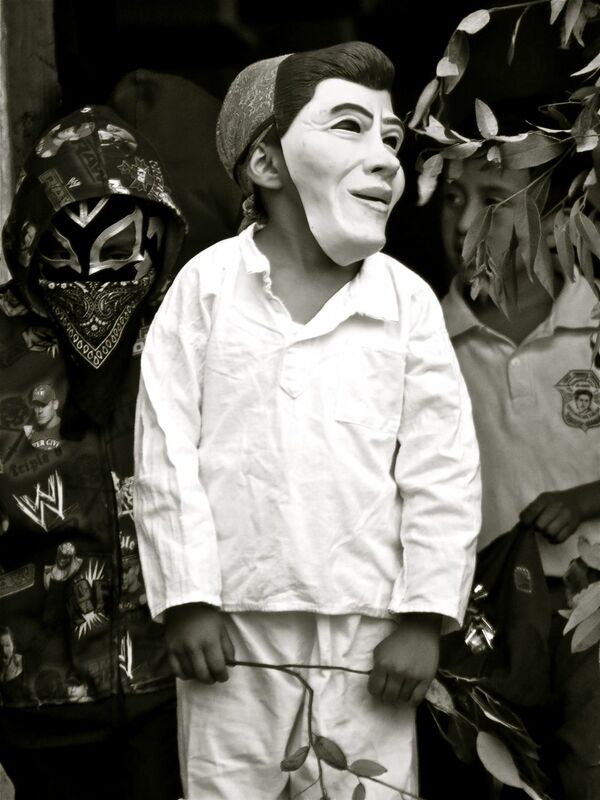 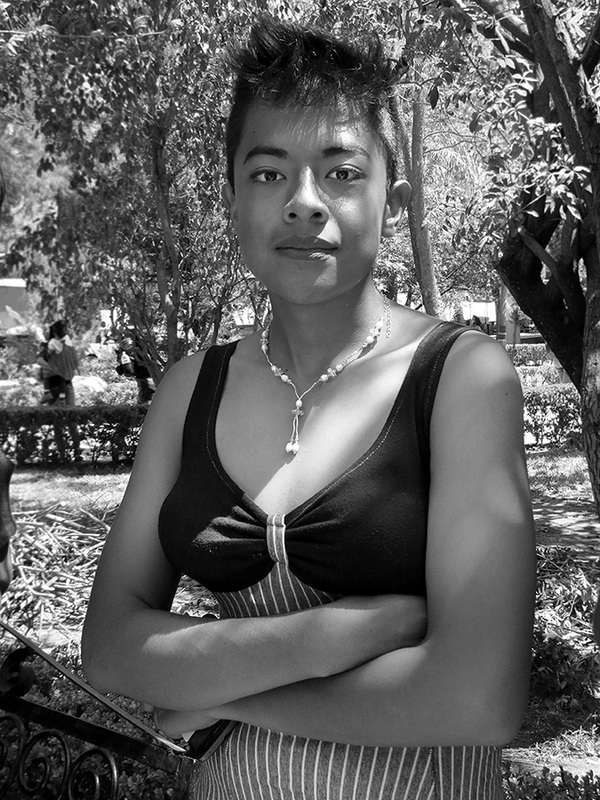 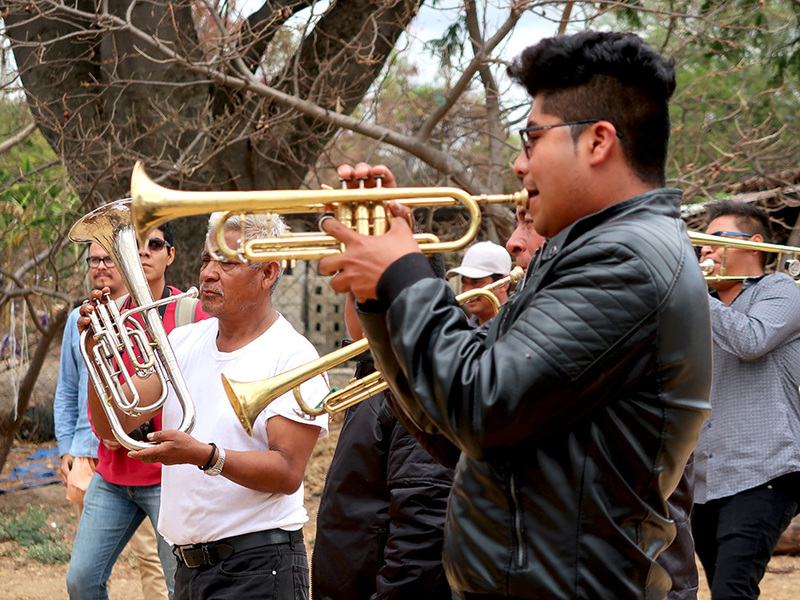 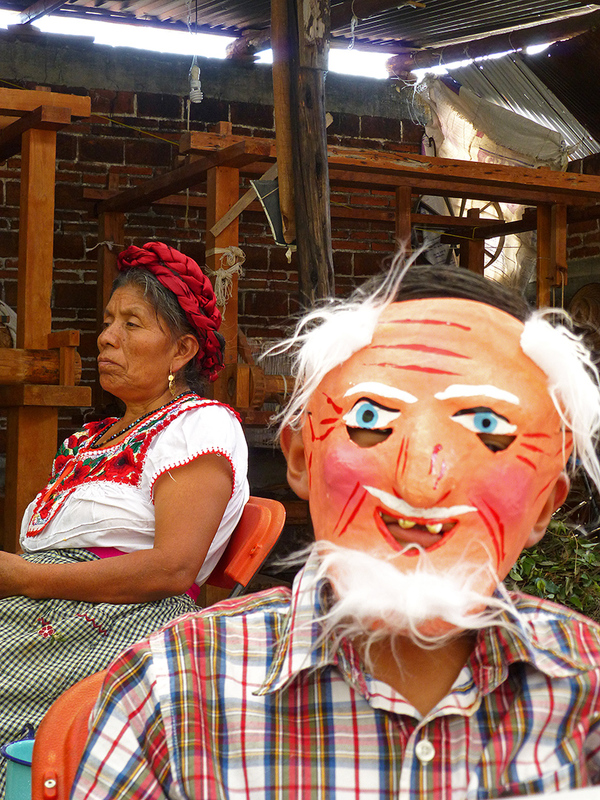 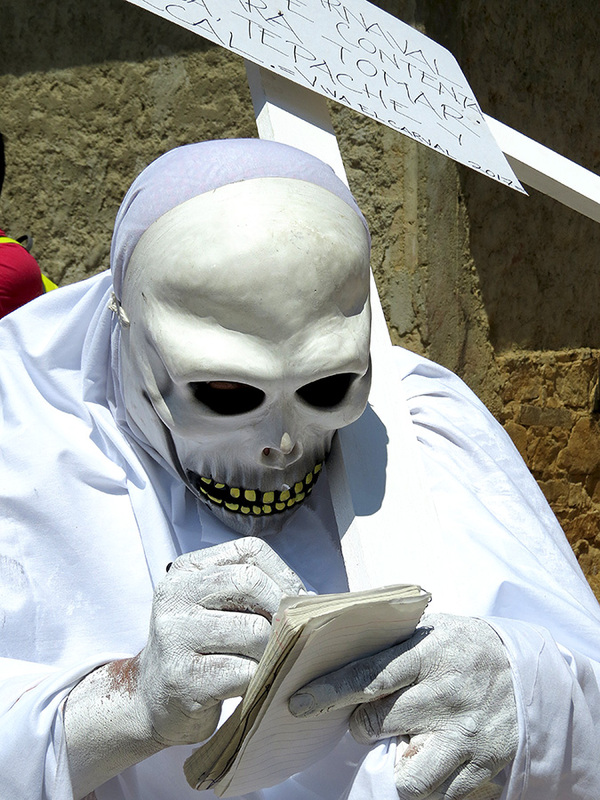 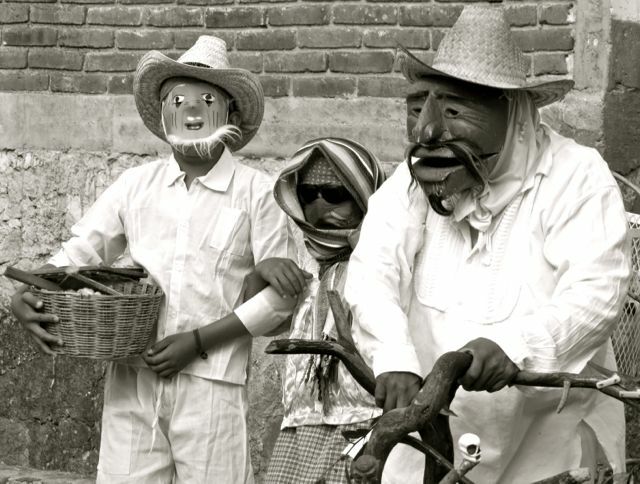 For some outstanding up-close and full color photos, head over to Oaxaca-The Year After.